WATKINS GLEN, February 25, 2019 -- Vernon Coffey, Chestnut Breeder and Database Manager for the American Chestnut Research and Restoration Project at the SUNY College of Environmental Science and Forestry at Syracuse University, will discuss the latest efforts to develop a blight tolerant American Chestnut tree at a public program on Saturday, March 23 from 12:30 p.m. -2:30 p.m. at the Montour Falls Library, 406 Main Street, Montour Falls. Brett Chedzoy of Cornell Cooperative Extension of Schuyler County will also talk about the loss of other key tree species over the past 50 years and what this means for the future health and productivity of our woodlands. This program is free and open to all area residents interested in work to restore the American chestnut tree, an iconic and valuable cultural symbol to the forest ecosystems of the eastern U.S., and in changes happening to other Northeast forest species. For more information contact Elaine Dalrymple, Schuyler County Soil and Water Conservation District, 535-0878. This meeting is being sponsored by the Schuyler County Water Quality Coordinating Committee in cooperation with the Schuyler County Soil and Water Conservation District, SUNY-ESF American Chestnut Research and Restoration Project, the Southern Tier Chapter of the NY Forest Owners Association, Cornell Cooperative Extension of Schuyler County and the Montour Falls Library. MONTOUR FALLS, Feb. 9, 2019 -- From maple sugaring to fruit production to growing hops, Schuyler County has a profound agricultural story, and it’s a story that’s just as strong today as it was 100 years ago. Cornell Cooperative Extension of Schuyler County and the Schuyler County Historical Society are partnering in 2019 to tell the stories, putting together a series of free monthly talks about past agricultural endeavors and what’s happening in those areas today. “Harvesting Schuyler’s Heritage, Conversations About Agriculture Across Time” launches on Thursday, Feb. 21, at the Valois-Logan-Hector Fire Department with a pancake supper paired with insights into maple sugaring in the county. The supper will be presented by the Hector Library and will feature maple syrup from Cornell University’s Arnot Teaching and Research Forest, located in the southeastern corner of Schuyler. Speaker Aaron Wightman oversees operations at the Research Sugarbush in the 4,200-acre Arnot Forest. The 6,000-tap maple operation serves as the primary research and education resource for the Cornell Maple Program. The pancake supper, which will also offer eggs and sausage, will begin at 5:30 p.m., with serving until 7 p.m. The supper will benefit the Hector Library. The cost will be $8 for ages 10 and up, $5 for ages 5-10 and free for under 5. Wightman’s talk will begin at 6 p.m. Attendees do not have to participate in the supper to enjoy the talk. The eight sessions of “Harvesting Schuyler’s Heritage” will be hosted across the county. The March 21 talk will be at Sunset View Creamery in Catharine. Owner Carmella Hoffman will discuss the region’s current cheesemakers, and Heather O’Grady Evans, an organizer of the annual Finger Lakes Cheese Festival at Sunset View, will discuss the area’s cheesemaking history. The free session, which will include a cheese tasting, will begin at 6 p.m.
Other “Harvesting Schuyler’s Heritage” subjects will be fruit production in April, forestry in May, honey production in June, grapes and wine in July, salt production in September and hops growing in October. “Our hope is that this series will remind us all of the rich history and strength of our agricultural heritage and the promise for continued growth and success in the future. We thank Cornell Cooperative Extension for an award of grant funds to help defray the costs of putting this on,” Cherry said. Watch local media for details about each session, or call Cooperative Extension at (607) 535-7161 or the Historical Society at (607) 535-9741. 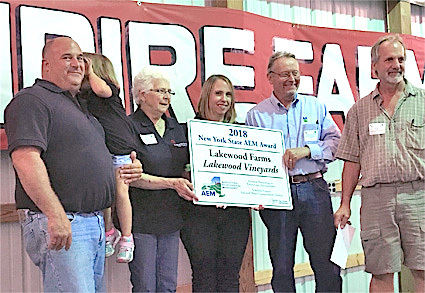 SCHUYLER COUNTY, Aug. 8, 2018 -- New York State today congratulated Lakewood Farm and Lakewood Vineyards, located in Watkins Glen, Schuyler County, as the recipient of the 2018 State Agricultural Environmental Management (AEM) Award. Each year, the award honors a New York State farm for its outstanding efforts to protect the environment through the preservation of soil and water quality and ensure the next generation of farming. This is the first time a New York State vineyard has been recognized with this long-standing award. The New York State Department of Agriculture and Markets, the Empire State Potato Growers, and the American Agriculturist Magazine presented the award to the Stamp family for implementing conservation best management practices that benefit the environment and protect the community. The award was presented at the annual Empire Farm Days event in Seneca Falls. Lakewood Farm & Lakewood Vineyards has implemented various practices to address issues that will improve soil health and protect water quality in neighboring Seneca Lake. 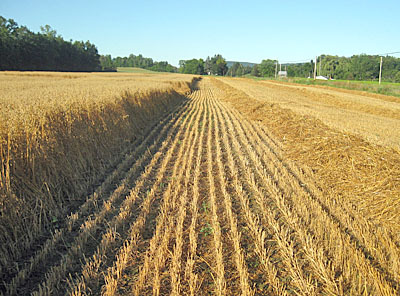 That includes cover cropping with fast-germinating rye and mulching hay, both of which stabilize soil, replace nutrients and retain moisture in the ground. Since 1951, the farm has grown from 52 acres to 85 acres while cutting its pesticide use nearly in half with a weather station that’s connected to Integrated Pest Management data and the use of regulated flow sprayers with reduced drift nozzles. The Stamps have reduced erosion and helped protect Seneca Lake -- a highly-rated drinking water source -- from pollutants in storm water runoff with clean water diversions and permanently vegetated buffers. The farm was one of the first to compost grape pomace with horse manure to create fertilizer and build organic matter into the soil. Today, the award-winning winery boasts 15 grape varieties and 100,000 gallons of production. Lakewood has worked closely with the Schuyler County Soil and Water Conservation District, which provides technical assistance to advance agricultural environmental management practices within the county. In the last 10 years, the Schuyler County Soil and Water Conservation District has secured nearly $16 million in funding for agricultural projects. That includes miles of lined waterways for erosion control, clean water diversions and grassed waterways, among other protective measures. Since 1940, the District has been working to conserve and enhance natural resources in Schuyler County through education, planning and implementation, addressing issues like improving water quality, the prevention of soil erosion and the management of natural resources. In addition to Lakewood, eight farms were nominated by their Districts for notable commitment to proactive environmental stewardship on their farms. They include operations in Chenango, Onondaga, Allegany, Chautauqua, Wayne, Genesee, Suffolk and Cortland counties. The annual Agricultural Environmental Management Award is jointly sponsored by the New York State Department of Agriculture and Markets, American Agriculturalist Magazine and the Empire State Potato Growers. Award winners are chosen from nominees submitted by County Soil and Water Conservation Districts from around the state. The first Agricultural Environmental Management Award was presented in 2002; prior to that, the award was known as the Agricultural Stewardship Award. Jason Kelly, Fire Chief of the Burdett Fire Department, teaches a student how to shoot a fire hose toward a specific location. MONTOUR FALLS, June 8, 2018 -- A total of 142 sixth-grade students from the Odessa-Montour, Bradford and Watkins Glen school districts attended the annual Schuyler County Soil and Water Conservation District-led Conservation Field Day on June 5 at the Millport Hunting and Fishing Club. The day-long program provided hands-on activities to stimulate youth to continue to explore and respect their natural surroundings and to remind them that there are many exciting things to do and learn in the out-of-doors. Students learned about floodplains, fire safety, birds of prey, mammal wildlife, reptiles and amphibians, and they learned how to fish and participate in archery safely. The Field Day was organized by the SWCD with assistance from the Millport Hunting and Fishing Club. The three school districts and their 6th grade teachers, the Schuyler County Water Quality Coordinating Committee and a number of individuals, local businesses and organizations -- including Schuyler County Cooperative Extension, the Burdett Fire Department, Southern Tier Central Regional Planning, Tanglewood Nature Center, and Chemung County SWCD-- also helped make the program a success. Special thanks, the SWCD said, "are extended to McIntyre’s Bait and Tackle in Beaver Dams for the donation of worms for the fishing station and to all the speakers who worked with the students." “The students, speakers and volunteers were tough this year, withstanding some brief rain showers -- but the skills learned, and the natural history information, and importance of local, volunteer fire companies that was shared with the students made it a stimulating, fun day,” said Elaine Dalrymple of Schuyler SWCD. Top: Students take aim at the archery station. Middle: Bridget Sharry of Tanglewood Nature Center explains turtle biology to the students. Bottom: Lily Bixby of Odessa-Montour Central School caught a nice largemouth bass during the fishing station. The fish was released. MONTOUR FALLS, May 9, 2018 -- The Schuyler County Water Quality Coordinating Committee (WQCC), in cooperation with the Finger Lakes Institute (FLI) and the Montour Falls Library, is sponsoring an "Aquatic Invasive Species Workshop" on Saturday, June 2 from 12:30 p.m. to 2:30 p.m. at the Montour Falls Library, 406 Main Street in Montour Falls. 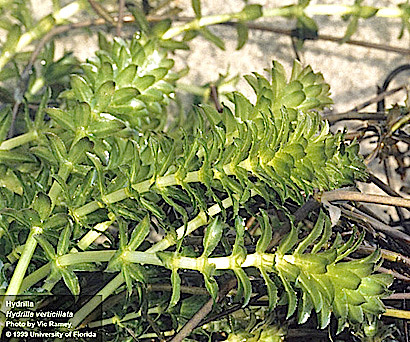 Hilary Mosher and Patricia Wakefield-Brown from FLI will help Lake Association members, boaters, fishermen, and marina owners to identify, report, and manage high priority aquatic invasive species such as hydrilla, starry stonewort, and water chestnut. This program is free, but if interested in workshop materials and a light lunch, please call Elaine Dalrymple, Schuyler County Soil and Water Conservation District (535-0878), by May 31. The Schuyler County WQCC is organized by the Schuyler County Soil and Water Conservation District. WATKINS GLEN, Feb. 16, 2018 -- Every year the Schuyler County Soil and Water Conservation District offers the Tree and Shrub Seedling Sale, also known as the Green Arbor Program, for landowners to purchase plants that not only encourage wildlife, prevent erosion, and protect water quality but beautify property. This year’s plant sale will give landowners an opportunity to conserve and enhance the natural resources of Schuyler County -- the mission of the Soil and Water District. Call the District at 535-0878 or visit the website for more information. GENEVA, Feb. 4, 2018 -- The Ontario County Soil and Water Conservation District (SWCD) is partnering with area agricultural professionals to put on a workshop focused on Soil Health and Nutrient Management. This workshop will take place on March 7, 2018 from 9:00 a.m. to 3:00 p.m. at Jordan Hall (630 West North Street) in Geneva. DEC pesticide applicator credits and Certified Crop Advisor Credits will be applied for. Lunch will be provided for all participants. This workshop will focus on the benefits of no-till farming, led by a lifelong New York dairy farmer, John Kemmeren. The potentials for doubling up with a winter forage will be covered by Tom Kilcer from Advanced Ag. Systems. Pest management of slugs in reduced tillage systems will be covered by Mike Stanyard of Cornell Cooperative Extension. Agricultural Water Management with today’s climate challenges will be covered by Tom Eskildsen from Schuyler County Soil and Water and Greg Albrecht from the NYS Department of Agriculture and Markets. An additional topic of the benefits of cover cropping by inter-seeding will be covered by Dave DeGolyer of the WNY Crop Management Association. Pre-registration for this meeting is required by February 23, 2018. The form for registration and agenda are on the Ontario County SWCD website at http://ontswcd.com/content. Contact Ontario County SWCD at (585) 396-1450 with any questions. There is a $20 per participant registration fee for the event, which includes lunch. 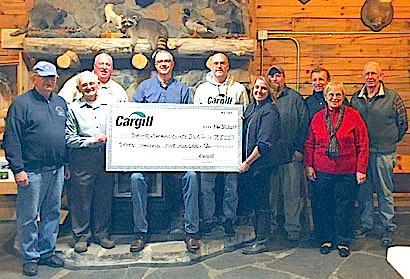 WATKINS GLEN, December 5, 2017 -- Cargill, Inc. awarded the Schuyler and Chemung County Soil and Water Conservation Districts $7,500 on November 30 to assist with a unique, state-of-the-art education project that will be utilized throughout the two-county area. This innovative project will allow for the purchase and conversion of a pull-behind trailer into a Stormwater Mobile Education Center. The Chemung County Stormwater Team is made up of a Professional Engineer, a Technician, and an Educator. They are housed with, and are a sub-unit of, the Chemung County Soil and Water Conservation District. 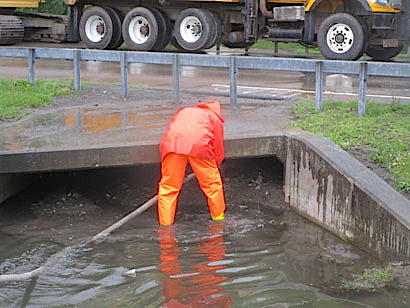 The Schuyler County Soil and Water Conservation District, through a formal shared services agreement, trades resources in order to have access to the special talents of the Chemung County Stormwater Team. The Chemung County Stormwater Team covers all of the stormwater-related work and education for Schuyler and Chemung Counties. The two Soil and Water Conservation Districts try to partner on as many projects and project areas as possible in order to get the most cost-effective product for residents and municipalities. The Mobile Stormwater Education Center will allow for hands-on education for all ages, say SWCD officials. This project, they note, will build a unit that could go to all community events and schools throughout Schuyler and Chemung Counties. The interactive education center will go to at least 10 locations a year and have a minimum of 5,000 children and residents pass through and use its interactive form of education. The trailer itself will be wrapped with educational awareness items for stormwater education and outreach. It essentially will be a traveling billboard of education while it travels from site to site, down the road. Inside there will be handouts, and informational screens where folks can answer questions and go through displays. There will also be a large sound-bar projecting information, and the touch screens will be tied to televisions. A large library of educational books will be purchased in order to change the display for a particular audience. Interactive games will be utilized from the Science Center in Rochester, NY. SCHUYLER, Sept. 19m 2017 -- The Schuyler County Soil and Water Conservation District (SWCD) will once again be working with USAg Recycling Inc. to offer local agricultural producers an environmentally “green,” convenient option for disposing of their empty agricultural plastic containers for the 2017 crop season. There will be a collection at the end of September. The service is free to farmers and provides an environmentally friendly alternative to throwing away agricultural containers. Collected containers are ground into chips and recycled as corrugated plastic field drainage pipe and other ACRC (Ag Container Recycling Council) approved products. Only HDPE #2 plastic containers will be accepted, ranging from less than 1 gallon to 55 gallon barrels. Large 250-gallon shuttle totes must be cut into 2-foot-wide pieces and be free of any hardware. To be acceptable for recycling, plastic containers must be empty, clean (triple rinsed), uncapped, and dry. Labels that come off without much difficulty should be removed. Pre-registration is required, so if you wish to participate in the upcoming collection, call Schuyler SWCD at 535-0878. To help store containers until pick-up time, bags that hold fifty to sixty 2.5-gallon containers are available for free upon registration. The following column was written by Danielle Wolleman, a student at Cornell University who is working this summer for Cooperative Extension in Schuyler County. Said Wolleman: "We are working on many interesting projects here in our teaching garden and it would be great to get the word out to members of the community on relevant topics." It’s hard not to be scared of insects. Many fly and buzz around us, just out of reach, reminding us of the times they hurt or annoyed us in the past. But not all insects are out to get us. In reality, these small creatures do much more good than harm. Beneficial insects get their name rightfully so, as their actions benefit both man and nature immensely. If we just take a step back from our human-centered world, it is easy to see just how helpful insects are. For a moment, imagine a world without flowers. This may seem like an extreme reality; but, in fact, flowers are not here for our enjoyment. Intriguing colors and a sweet fragrance serve to attract pollinators to an abundance of free pollen and nectar. In exchange, these insects spread pollen and assist with fertilization, a necessary step in the reproductive life of the flowers and fruit that surround us. Pollinators are only a fraction of the equation. Recyclers provide services including churning soil, transporting nutrients, and dispersing seeds. Ants are an example of this recycling group, whose underground tunnels aerate the soil and ensure the presence of vital elements in the soil’s structure. While parasitic and predatory insects sound concerning, these small creatures ensure that the natural order of the world is maintained. This balance is known as “natural control,” and is present to ensure a sustainable ecology. Unfortunately, when this balance is disrupted, biological controls or human intervention may be necessary to restore the natural order. Therefore, when making any sort of decision regarding insects, it is important to know what you are working with and how actions may cascade through the ecosystem. In Eric Grissell’s book "Bees, Wasps, and Ants", he explains “it is not easy taking the role as champion for the underdog, but my sympathies distinctly lie with the largely unknown and misunderstood members of the order.” In order to improve this misunderstanding, it is best to start with a bit of information. 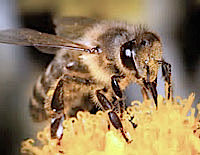 A “sting” is administrated from the rear end of the insect, while a “bite” refers to an action from the front. Nuisance insects like sugar and protein-feeding ants may find a way into your snack drawer. In this scenario, restoring natural order would mean implementing a biological control in response to the influx of a particular insect. When ecological balance is disrupted, spikes in insect populations cause many to see them as “pests” that need to be exterminated. In some cases, when an infestation is extreme, it may be necessary to get rid of an invasive colony or call in some specialized assistance. This is especially true when dealing with vespid wasps -- yellow jackets, hornets, and paper wasps -- arguably the most feared group within the insect community. Certainly, if you find yourself dealing with an overwhelming colony of insects, it is best to seek professional help in order to address the problem properly. It should be pointed out, however, that it is best to leave the natural order untouched. While some bugs do have the potential to sting, their main goal is to perpetuate a vibrant habitat and be productive within it. Some insects may even perform functions you are benefitting from without your awareness. Yellow jackets, for example, serve as a natural control of other insect populations, including flies and spiders. Alternatively, native bees, who nest and overwinter in separate holes or the ground, are often overlooked and unsupported. Unfortunately, without the wild species present, our global food system would be in turmoil. Therefore, it is important to consider what insect you are coming in contact with and how your intervention may affect other parts of the ecosystem at large. Once we acknowledge the impact of insects, it would be wise to stop exterminating the innocent creatures and start helping them. Cornell Cooperative Extension is a great resource to utilize in dealing with insect-related questions and concerns. If you reach out to your local Extension office, staff will do their best to provide relevant information and advice in solving a variety of issues you may face. And if you want to learn more about beneficial insects, please join us at the Cornell Cooperative Extension Schuyler County Teaching Garden for a Party for the Pollinators on August 7th from 5-7 p.m. It is because of peach cobbler that I love growing my own fruit and produce. I have fond memories of shaking the branches of my family’s peach trees and hearing each plump fruit drop to the ground, just waiting to be eaten. Once inside, the fresh fruit sliced like butter. Hot from the oven, the juicy cobbler was always delicious and I felt a sense of pride being able to make something from my own garden. But recently, the trees have been bare. Year after year the fruit has failed to develop. I almost gave up hope. Would the memories be all that remained of the peach cobbler? But then, I went home one weekend this summer. Fruit! Lots of it! Growing on all the trees we had. What had changed? I walked among the trees and saw the reason. Bees! Everywhere! They were buzzing among the flowering weeds and pollinating our fruit trees in the process. I wanted to thank them and give them a hug for bringing back my peaches. When I returned to work, I saw the same activity in the Cornell Cooperative Extension Teaching Garden. For the first time in eight years, bees had pollinated the kiwis’ flowers and the plant started to fruit. Bees, moths, flies, and beetles are just some of many insects who are responsible for pollinating various plants in our backyards. In fact, the impact of these small creatures has a global reach. Pollinators are involved in the production of some of the most abundant and important crops all around the world. Their presence is therefore necessary for the balance and diversity of plant and animal communities. For some organisms, beneficial insects are a tasty meal. For others, beneficial insects are a threat to their short lives. Whatever relationship one may have with pollinators, their importance is undeniable. Instead of exterminating the bugs, you can support these beneficial creatures in simple ways. It starts by just observing. Look for insect movement, on flowers, near nesting holes, and around other insect-related spots in the garden. Once you recognize the type of habitat the pollinators prefer, it will be easy to tailor your garden to foster even more activity. But remember, it is best to leave nesting sites and existing insect habitat untouched. With just a few natural materials, you can provide the pollinators with additional nesting or overwintering sites. You can also plant an assortment of forage plants and minimize the use of pesticides. If you don’t feel like pulling out the flowering weeds in your garden, leave them. Many pollinators enjoy the pollen and may even be able to extend their reproductive season by having this foraging opportunity available. If you want to spice up your garden, the pollinators certainly will be thankful for a diversity of flowers. Plants with varying growing seasons, heights, sizes, shapes, and colors will benefit both the indoor and outdoor residents of your home. I am fortunate to be an intern in the CCE Teaching Garden this summer, with the ability to observe the results of these efforts. Native bees, ladybugs, beetles, and butterflies are frequent visitors to our foraging flowers and add to the already vibrant landscape. If you care to check us out, receive more information, or have a question, do not hesitate to reach out to your local Cornell Cooperative Extension office. Educators and volunteers will be happy to help answer any and all of your pollinator questions. ALPINE, June 30, 2017 -- The Schuyler County Soil and Water Conservation District (SWCD) received a call recently notifying it of an outlet control structure failure on an expansive, 33-acre, New York State DEC wetland in the Town of Hector off of NYS Route 228, just north of the Town of Catharine line. If left uncorrected, the entire wetland would have drained in less than 24 hours. This wetland is home to tens of thousands of fish, turtles, amphibians, and diverse plant life that would all be lost if the wetland went dry. Nearly two thirds of the water had already drained, but no fish were yet lost. The SWCD and its two highly skilled operators, Jim Barrett and Michael Manwaring, were able to respond immediately. The Soil and Water District utilized its own equipment, as well as equipment from Bergen Farms. The District was assisted by the Town Catharine Highway Department, which provided its loader, roller, dump truck and multiple operators. The Schuyler County Highway Department also assisted by bringing in large beams to walk the equipment out onto the very wet dike. The first step was to stop the outflow of water. This was done by sealing off the failed outlet control structure with both clay and a specialized, impermeable grout type of concrete. The next step in the process was to build a coffer dam out of clay in order to open up the dike itself to install a new outlet control structure. This was completed immediately and water levels began to recover. During inspection of the site, it was noticed that the dike itself was in very poor condition. This was due to water breaching the dike many times, as the outlet control structure had not been functioning properly for some time. It was also noticed that the earthen, emergency spillway had eroded severely and the only thing that would retain the water in the wetland (even with a functioning, primary outlet control structure) was an existing beaver dam. So the SWCD rebuilt the dike itself, and then stabilized the emergency outlet utilizing rip rap and clay material. Over 400 tons of rip rap was used to make the repairs. With all of the rain that soon followed, it didn’t take long for the wetland to fully recover. WATKINS GLEN, June 30, 2017 -- Monday, June 5 brought an isolated, intense storm to the Village of Watkins Glen. With this storm came several inches of rain in less than an hour, causing significant flooding to several local businesses. The storm left behind damage to already stressed, local infrastructure. The Schuyler County Soil and Water Conservation District (SWCD) was able to organize a shared services effort between many of the local highway departments to aid in the recovery process from this event. The first step in the process was to excavate a waterway that runs down Fairgrounds Lane in the Village of Watkins Glen. 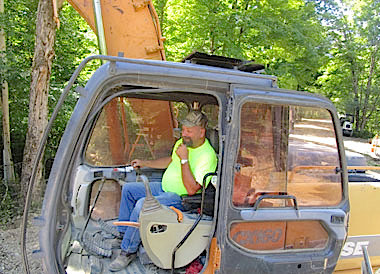 The Schuyler County Soil and Water Conservation District was able to utilize the Town of Hector’s excavator, and one of SWCD’s operators, Jim Barrett. The County Highway Department and the Town of Dix provided several trucks to haul the deposited sediment away. The Village of Watkins Glen Highway Department provided traffic control. Over 30 truckloads of sediment were hauled away. The second step was to clean a box culvert that runs underneath Fairgrounds Lane itself. This significant culvert was almost completely full of sediment. The SWCD provided its excavator and operators, the County Highway Department provided a truck, the Village of Watkins Glen provided traffic control and labor, and the Town of Montour Highway Department provided its fire truck and labor. This second step was labor intensive, in very poor conditions. It was an arduous but necessary process. This task was completed by Carl Silliman from the Town of Montour Highway Department and Scott Taylor from the Village of Watkins Glen Highway Department. "Both Carl and Scott," the SWCD said, "went way above and beyond to make this a successful project. They were in the box culvert the entire day in standing water, crawling the 40-plus feet back and forth to flush the culvert out. This process took nearly 21,000 gallons of water. Carl and Scott never complained or stopped working the entire day. Their diligence and perseverance in these horrible conditions helped mitigate a substantial flooding issue for our local businesses and residents." The third step in the process will follow soon when the New York State DOT cleans out the culvert under New York State Route 14, just north of Fairgrounds Lane. Later this summer, the SWCD will assist with stream stabilization efforts on the west side of NYS 14. "By all of the above organizations working together toward a common goal," said SWCD, "impacts from these severe storm events are mitigated in the most cost efficient way possible." SCHUYLER COUNTY, June 12, 2017 -- The Schuyler County Soil and Water Conservation District (SWCD) will once again be working with USAg Recycling Inc. to offer local agricultural producers an environmentally “green” and convenient option for disposing of their empty agricultural plastic containers for the 2017 crop season. There will be a collection this spring and fall. Pre-registration is required, so if you wish to participate in the spring collection, call Schuyler SWCD at 535-0878. To help store containers until pick-up time, bags that hold fifty to sixty 2.5-gallon containers are available for free upon registration. 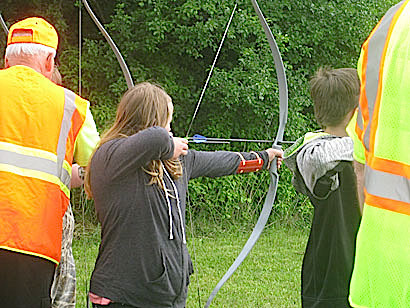 MONTOUR FALLS, June 6 -- A total of 130 sixth-grade students from the Odessa-Montour and Watkins Glen School Districts attended a program, Conservation Field Day, on June 6 at the Millport Hunting and Fishing Club. The day-long program provided hands-on activities to stimulate youth to continue to explore and respect their natural surroundings and to remind them that there are many exciting things to do and learn in the out-of-doors. Students learned about floodplains, forestry, fire safety, birds of prey, mammal wildlife, and the K-9 dog handler program, and they learned how to fish and to participate safely in archery. The Field Day was organized by the Schuyler County Soil and Water Conservation District (SWCD) with important assistance from the Millport Hunting and Fishing Club. The two school districts and their 6th grade teachers, the Schuyler County Water Quality Coordinating Committee and a number of individuals, local businesses and organizations -- including Cotton Hanlon, the Watkins Glen Fire Department, the Schuyler County Sheriff’s Department, Southern Tier Central Regional Planning, Tanglewood Nature Center, Chemung County SWCD and Schuyler County Cooperative Extension -- also helped make the program a success. "Special thanks," said a spokesperson for the Schuyler SWCD, "are extended to McIntyre’s Bait and Tackle in Beaver Dams for the donation of worms for the fishing station and to all the speakers who worked with the students." Top: Alyiah Bentley of Watkins Glen Central School shoots at the archery station. She hit the bullseye, and about the same time so did Watkins student Thomas Goltry-Koots. Second: Dallas Johnson of Watkins Glen Central School caught a nice bluegill during the fishing station. The fish was released. WATKINS GLEN, April 22, 2017 -- The Schuyler County Soil and Water Conservation District held its 37th annual Green Arbor Program distribution of bare root seedlings and transplants on Saturday, April 22 -- Earth Day. A total of 135 residents purchased trees and shrubs, rain barrels, and bluebird boxes this year. Over a million conservation plants have been planted locally since the program began in 1980. Steve Smolen of Hector has been buying trees from the Green Arbor program since 1989 and he has planted, so far, over 1,500 trees and shrubs on his 65 acres. Taylor Kane and Emily Chaffinch of Montour Falls came with Emily’s mother, Billee, and they are planting a hedgerow around part of the Chaffinch property. Regina Westervelt of Watkins Glen, her brother Dwayne Simpson and his granddaughter, Kaydance, 6, of Beaver Dams will be planting some fruit trees. Regina will be giving the cherry trees to her daughter who has recently purchased property in the Town of Dix. Diane Buglion-Mannion, owner of Rasta Ranch winery in Hector, is planting more butterfly bush in gardens near her winery. “The butterflies love them, especially the butterfly moth, which is as big as a hummingbird and looks extraterrestrial,” she said. Established in 1940, the Schuyler County Soil and Water District provides farmers, homeowners, organizations and municipalities with technical assistance to help conserve natural resources and be good stewards of the land. Services include conservation practices to protect water quality, erosion and sediment control, stream stabilization, land drainage, assistance in obtaining state and federal permits, conservation education, map making and much more. A fish stocking program continues and the deadline for ordering for the spring program is May 1. Visit the website for an order form or call the District at 535-0878 for more information. Top: Taylor Kane, Emily Chaffinch and Billie Chaffinch of Montour Falls. Middle: Dwayne Simpson, his granddaughter Kaydance, 6, and Dwayne’s sister, Regina Westervelt. WATKINS GLEN, April 17, 2017 -- Seneca Sunrise Coffee, 806 Decatur Street in Watkins Glen, will present Meet The Farmers at its business from 11 a.m. to 3 p.m. on Saturday, April 22. The event will highlight local farms and food producers. Representatives of Ever Green Farm (Rock Stream), Shannon Brook Farm (Watkins Glen) and Wide Awake Bakery (Trumansburg) will be on hand to sample out their products and talk to visitors about community-supported agriculture, organic farming practices, and the role local farms and producers can play in eating healthier. Organizers say the event ties in with an increasing interest in shopping and eating local and offers alternatives to shopping at conventional grocery stores. Admission to the event is free. There will be a complimentary tasting of locally-roasted coffee, as well as samples of local cheeses, honey, oil, jams and jellies. In addition, Seneca Sunrise Coffee offers a free cup of coffee and cup of soup to anyone who volunteers for the Community Clean Up event that same morning. For more details, visit https://www.facebook.com/SenecaSunriseCoffee/events/. SCHUYLER COUNTY, April 17, 2017 -- Area farmer and forester Brett Chedzoy has been presented the New York Forest Owners Association (NYFOA) chapter service award for the organization's Southern Finger Lakes chapter. The honor was bestowed as part of NYFOA's annual meeting held April 8 at the SUNY College of Environmental Science and Forestry in Syracuse. "The recipient of the service award for the Southern Finger Lakes chapter is Brett Chedzoy. Brett has been a NYFOA member for over 25 years, and has ably served as SFL secretary for the past eight. Over this time, he has been a steadfast participant, record keeper, and organizer within the chapter steering committee, and he and his family have graciously hosted a number of chapter woodswalks and social events. Never one to be at a loss for words, Brett has also usually served as the chapter’s default master of ceremonies. "Brett’s background and training as a forester have been invaluable to the chapter. He has always proved willing to share his wealth of knowledge and experience with the steering committee and chapter at large, and despite the challenges of promoting long-term, sustainable forest management to a public that all-too-often is primarily concerned with maximizing short-term profit, he has done so with a consistently positive attitude, and with a good sense of humor. "In addition to volunteering his time with NYFOA, Brett works as a regional extension forester for Cornell, is a regional director of the Master Forest Owner program in the Southern Tier, and somehow also manages to find time to be a successful livestock farmer, an innovator in the practice of silvopasturing, as well as an active steward of his own woodlot. "In promoting NYFOA’s mission, he clearly leads by example, and sets a high bar for the rest of us. The Southern Finger Lakes chapter is glad to have him, and we are pleased to present him with the service award for 2017." WATKINS GLEN, April 11 -- The Schuyler County Soil and Water Conservation District (SWCD) is reminding residents that the order deadline for the Spring Fish Stocking Program is approaching -- May 1. The six species of fish available to order in the spring are largemouth bass, channel catfish, fathead minnows, rainbow trout, hybrid bluegill and triploid grass carp. A minimum of 10 fish must be purchased except for the grass carp, which requires a NYS permit before stocking is allowed. Also available for purchase are fish food, and materials to help clear ponds of algae such as beneficial bacteria, barley pellets and pond colorant. Fish will be delivered in boxes with oxygen injected water, and buyers do not need to bring a container when picking up the fish. The delivery date and time for the spring program will be May 12 from 11:00 am to 12:00 noon at the Lee Harlan Soil and Water Conservation Center at 2400 Meads Hill Road, Watkins Glen. For price information and order form, visit the SWCD website at www.schuylerswcd.com or call 535-0878. WATKINS GLEN, Feb. 24, 2017 -- The Schuyler County Soil and Water Conservation District (SWCD) held its Annual Luncheon at the media center of Watkins Glen International Friday. The purpose of the annual banquet is to showcase to the region’s municipal officials the vast and diverse conservation implementation that the Schuyler County Soil and Water Conservation District performs on an annual basis. In recognition of the necessary shared service effort and assistance it takes to implement such a portfolio of projects, the Soil and Water District presents annual awards. -- Merit Award recipients were Tom Beach and Brian Sidle from the Town of Cayuta Highway Department, and Todd Jansen from the Town of Horseheads Highway Department. -- Lifetime Service Award winners included Phil Biever and Jessica Skinner. Sperry Navone, Chief of Staff for New York State Assemblyman Philip Palmesano and also representing State Senator Tom O’Mara, presented joint proclamations to all awardees. Alison Hunt, District Director for Congressman Tom Reed, also presented the award winners with special certificates from the Congressman’s office. A variety of conservation projects implemented from 2016 were showcased to the audience of over 150 attendees that included federal, state and local officials, municipal staff, and farmers. "These projects," said an SWCD spokesperson, "exemplify the unique and concerted effort of shared services work to ensure the most cost-effective means for on-the-ground conservation." The presentation also highlighted the millions of dollars of competitive grant funding brought into the community and the multiplier effect it has on the local economy. --15 large-scale farm projects, among them: forced air composting of winery pomace; a covered barnyard; a covered manure storage; a silage leachate total collection system; drainage work, diversions and waterways; riparian buffer creation; alternative watering facilities; rotational grazing projects; a commodity barn; and access road improvements. "Every year," said an SWCD press release, "the Soil and Water Conservation District focuses on implementation of conservation for the betterment of the community and its water quality and natural resources. To make that happen, a large effort is made to obtain highly competitive grant funding for our region. Ninety-eight percent of the Schuyler County Soil and Water Conservation District’s funding is secured through competitive state and federal funding sources. This year the district secured nearly $4 million in total project funding for agricultural efforts and over $3 million in total project funding for non-agricultural efforts. To obtain more information about Soil and Water programs, visit www.schuylerswcd.com or call 535-0878. YATES COUNTY, Feb. 14, 2017 -- This past year New York State Senator Tom O’Mara assisted Yates County by providing a direct line item in the Environmental Protection Fund (EPF) to the Yates County Soil and Water Conservation District (SWCD). The funding was utilized to repair and stabilize sections of the Keuka Lake outlet and the Outlet Trail that were damaged during previous floods. A severe, nearly vertical bank failure occurred during one flood event, causing an extensive amount of erosion and sedimentation, and also posed a danger to walkers on the Outlet Trail. A second section of the outlet was also identified as needing immediate attention to repair flood damages before the conditions deteriorated further. Yates County SWCD took the lead on administering the grant and coordinating the restoration work. Yates County Soil and Water worked with the Chemung and Schuyler County Soil and Water Conservation Districts on this joint effort. Chemung County SWCD provided the necessary engineering and design work to obtain the required permits for the two project locations. Chemung and Schuyler County SWCDs provided experienced equipment operators Todd Jansen and Jim Barrett as well as the equipment necessary to repair the flood damage. All three Soil & Water Districts provided significant additional staff labor to complete the projects. The major project was to stabilize a 200-foot damaged section that included the vertical collapsed bank. 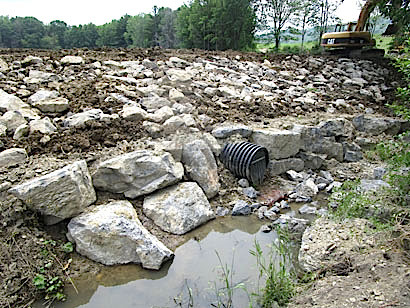 The stabilization method utilized was a geo-grid rock revetment technique. 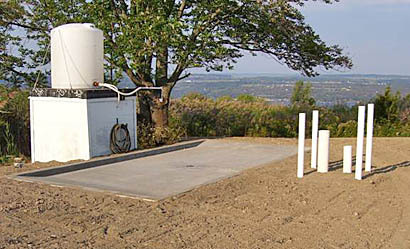 This unique, state-of-the-art method has been implemented successfully several times over the last few years by the Chemung County SWCD. "Utilizing their expertise in this type of practice was a key to success of the project," said the Schuyler SWCD in a press release. The second project area stabilized 300 feet of flood-damaged stream bank. Large, dimensional rock now protects the once eroded banks, and Bendway Weirs were installed at the base of the rock to safely re-direct water flows. As the projects were nearing completion, the Town of Milo and the Highway Department provided staff and equipment to restore the Outlet Trail walking paths in the project areas. "Soil and Water Conservation Districts state-wide work together and with local municipalities on a regional basis to put the most cost-effective conservation efforts on the ground," said the press release. "This project is a great example of cooperation and shared services that benefit water quality and taxpayers. This initiative would not have been possible without the funding support of Senator Tom O’Mara." SCHUYLER COUNTY, Feb. 14 -- This past year, New York State Senator Tom O’Mara assisted Schuyler County by providing a direct, line item in the Environmental Protection Fund (EPF) to the Schuyler County Soil and Water Conservation District. The funding was utilized to construct the Jackson Creek flood attenuation and fish habitat project in the Town of Cayuta. This project removed two vastly undersized culverts under Decker Road in Jackson Creek and replaced them with a large box culvert. The intent of this project was to eliminate a large flooding risk to nearby County Route 13. Along with the flood attenuation aspect, the project also aided fish passage in Jackson Creek, which is a direct tributary of Cayuta Creek. The work, says SWCD spokesmen, would not have been possible without the funding assistance from Senator O’Mara. This project, SWCD said,, showcased "a true shared service effort." A key component of the Schuyler County Soil and Water Conservation District’s methodology is cost-effective project implementation for the region and its taxpayers; such an approach, officials say, was crucial to the success of this project. A SWCD press release explains: "A great deal of assistance was provided by the Town of Cayuta Highway Department, especially Tom Beach and Brian Sidle, who were instrumental in making this a successful project. Tom coordinated: locations for placement of excavated material; trucking assistance from surrounding towns; and landowner easements. Tom himself hauled material in and out and provided a tremendous amount of labor, wherever it was needed on the project. Brian also hauled material, and his previous experience with Silverline Construction made him a key person to assist in the actual placing of the box culvert itself. Anytime a hand was needed Brian was there to help. "The Chemung County Soil and Water Conservation District (SWCD) was also an integral part of the project. The Chemung County SWCD provided an excavator, dozer, and loader for the project. They also provided their equipment operator, Todd Jansen, whose expertise made the job possible. Having just completed a similar box culvert installation in Chemung County, Todd could take a leadership role on the project. He worked jointly with Schuyler County Soil and Water Conservation District’s equipment operator, Jim Barrett, which made for an extremely efficient project. Jim Barrett’s dedication and expertise is second to none. Both operators, each having well over 30 years’ experience, meant there was little need of communication or direction -- each knew the task at hand. "The project was also assisted by many other agencies. The Schuyler County Highway Department provided all the signage necessary for closing the road, and provided a truck to haul material for several days. The Towns of Van Etten and Newfield also provided trucks on multiple days for hauling material. The Town of Horseheads helped to move equipment onto and off of the site. The Town of Hector provided an excavator for use on the project. The Town of Montour provided a trash pump that helped keep the site dry by pumping water around it. "This group effort is organized on nearly every project that is implemented by the Schuyler County Soil and Water Conservation District so that funds go farther and more areas can be addressed by the grant dollars brought into our region. The Schuyler County Soil and Water District thanks all those individuals and departments that made this important project possible, especially Senator Tom O’Mara." Top: Jackson Creek under Decker Road after completion of the project. SCHUYLER COUNTY, Jan. 11 -- Every year -- and again in 2017 -- the Schuyler County Soil and Water Conservation District offers the Tree and Shrub Seedling Sale, also known as the Green Arbor Program, and the Fish Stocking Program. The Green Arbor Program allows landowners to purchase plants that not only encourage wildlife, prevent erosion, and protect water quality but beautify property. The fish stocking program helps pond owners enhance species diversity and provides a closer location to purchase fish. The Conservation District Green Arbor program offers a wide selection of evergreen trees, deciduous trees, shrubs, tree fruit and small fruits (including apple, cherry, pear and peach trees, blueberries, blackberries, raspberries, strawberries and grapes), and groundcovers. Also offered are fertilizer tablets, rain barrels, bluebird houses, weed mats and tree tubes. The order deadline for trees and shrubs is March 10, 2017 and orders should be placed as early as possible to ensure availability. The six species of fish available to order in the spring are largemouth bass, channel catfish, fathead minnows, rainbow trout, hybrid bluegill and triploid grass carp. A minimum of 10 fish must be purchased except for the grass carp. Grass carp require a NYS permit before stocking is allowed. Also available for purchase are fish food, and materials to help clear ponds of algae such as beneficial bacteria, barley pellets and pond colorant. Three species of fish will be available in the fall stocking program -- yellow perch, black crappie and fathead minnows. The district partners with Fish Haven Farms in Candor, NY to provide these species of fish to residents. Fish will be delivered in boxes with oxygen injected water, and buyers do not need to bring a container when picking up the fish. The deadline for the Spring Fish Stocking Program is May 1, 2017 and the Fall Stocking Program order deadline is October 2, 2017. Tree and fish order forms are available at the Schuyler County Soil and Water District office or online at www.schuylerswcd.com. This year’s plant and fish sales, says the SWCD, will give landowners an opportunity to conserve and enhance the natural resources of Schuyler County. Call the District at 535-0878 or visit the website for more information. WATKINS GLEN, Dec. 3, 2016 -- The United States Department of Agriculture's (USDA) Natural Resources Conservation Service (NRCS) will hold its annual Local Working Group meeting for Cortland, Schuyler and Tompkins Counties on Tuesday, Dec. 20. The meeting will be held from 10 a.m. to 12 noon at the Tompkins County Soil and Water Conservation District, 170 Bostwick Road, Ithaca. The public and interested stakeholders are encouraged to attend. The Local Working Group will focus on identifying agricultural and natural resource issues existing in area communities and providing information and feedback to direct NRCS programs. Participants may be agricultural producers; owners of nonindustrial private forest land; representatives of agricultural and environmental organizations; and representatives of governmental agencies carrying out environmental, agricultural, or natural resource conservation programs and activities. NRCS Local Working Groups are subcommittees of the NRCS State Technical Committee and meet annually to provide recommendations on local natural resource priorities to assist USDA-NRCS in providing Farm Bill conservation programs in New York. For more information, visit http://www.nrcs.usda.gov/getstarted or contact District Conservationist Patrick Barry at (607) 257-2737 or at patrick.barry@ny.usda.gov. SCHUYLER COUNTY, Sept. 8 -- The Schuyler County Soil and Water Conservation District (SWCD) will once again be working with USAg Recycling Inc. to offer local agricultural producers an environmentally “green,” convenient option for disposing of their empty agricultural plastic containers for the 2016 crop season, SWCD has announced. Pre-registration is required by September 28, 2016. The service is free to farmers and provides an environmentally friendly alternative to throwing away agricultural containers, officials said. Collected containers are ground into chips and recycled as corrugated plastic field drainage pipe and other ACRC (Ag Container Recycling Council) approved products. Only HDPE #2 plastic containers will be accepted, ranging from less than 1 gallon to 55-gallon barrels. Large 250-gallon shuttle totes must be cut into 2-foot-wide pieces and be free of any hardware. To be acceptable for recycling, plastic containers must be empty, clean (triple rinsed), uncapped, and dry. Labels that come off without much difficulty should be removed. Pre-registration is required, so if you wish to participate in the fall collection, call Schuyler SWCD at 535-0878. To help store containers until pick up time, bags that hold fifty to sixty 2.5-gallon containers are available for free upon registration. WATKINS GLEN, August 28, 2016 -- The Schuyler County Soil and Water Conservation District wants to remind residents that the order deadline for the Fall Fish Stocking Program is approaching -- October 3. The three species of fish available to order in the fall are yellow perch, black crappie, and fathead minnows. A minimum of 10 fish must be purchased. Fish will be delivered in boxes with oxygen injected water, and buyers do not need to bring a container when picking up the fish. The delivery date and time for the fall program will be October 14 from 10:30 to 11:30 a.m. at the Lee Harlan Soil and Water Conservation Center on Meads Hill Road. For price information and an order form, visit www.schuylerswcd.com or call 535-0878. WATKINS GLEN, July 27, 2016 -- Angus Glen Farm, owned by the Chedzoy family of Watkins Glen, was honored Tuesday, July 26, with an Agricultural Environmental Management (AEM) "Farmers Partnering to Protect Our Environment" roadside sign recognizing the family's exemplary conservation of natural resources and commitment to environmental protection. The award was presented at the annual Schuyler County Farm Bureau summer picnic attended by over 130 people and held at Clute Park in Watkins Glen. The Schuyler County Soil and Water Conservation District sponsors the AEM program, and the Farm Bureau and Schuyler County Agriculture and Farmland Protection Board are co-sponsors of the awards with the Conservation District. Angus Glen Farm, located in the Town of Dix, has been in the Chedzoy family since the 1980s. It was purchased by Jim and Rose Chedzoy, but was not actively farmed by their family until 2002 -- when their son, Brett, and his wife, Maria, returned to the area and started a grass-fed, beef operation. Angus Glen Farm is recognized regionally for the quality of its Angus beef cattle both genetically and for flavor and tenderness. The Chedzoys also are known for their knowledge of silvopasturing, where cows can graze in the woods, and for their pasture rotational grazing system -- both done with extreme care to protect soil health and forest quality. The Chedzoys have 90 cow-calf pairs on 190 acres of their own land, and they rent another 140 acres. Almost all of the land is in intensively managed pasture and hay with 75 distinct pastures. Everyone in the family, including Brett and Maria’s children -- Ian, Clara and Joe -- help to move the cows between the pastures on a regular basis to prevent overgrazing and potential erosion, and fencing and watering systems are maintained regularly to prevent emergency fixes. Vegetated buffers near drainageways are protected to keep good water quality, and a heavy use area was eliminated. They use round bale grazing in the winter so they can feed their cows year-round with little purchased feed. "The AEM program helps us to better manage our resources and I would encourage any type of farm to participate in the program,” said Brett Chedzoy, who is also a forestry specialist with Cornell Cooperative Extension. AEM is a statewide program with over 10,000 farms voluntarily participating. To learn more about the AEM program in Schuyler County, visit www.schuylerswcd.com or call the Schuyler County Soil and Water Conservation District at 535-0878. Students practice their newly learned archery skills at the Conservation Field Day. 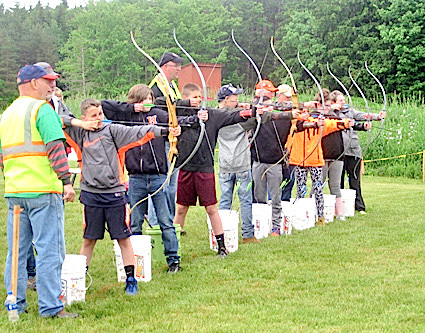 MILLPORT, June 8 -- More than 155 sixth-grade students from the Bradford, Odessa-Montour and Watkins Glen Central School Districts attended a program, Conservation Field Day, on June 7 at the Millport Hunting and Fishing Club. The day-long program provided hands-on activities to stimulate youth to continue to explore and respect their natural surroundings and to remind them that there are many exciting things to do and learn in the out-of-doors. Students learned about floodplains, forestry, fire safety, birds of prey, and other wildlife, including mammals and insects, and they learned how to fish, and do archery safely. The Field Day was organized by the Schuyler County Soil and Water Conservation District (SWCD) with assistance from the Millport Hunting and Fishing Club. The three school districts and their sixth-grade teachers, the Schuyler County Water Quality Coordinating Committee and a number of local businesses and organizations -- including Cotton Hanlon, the Watkins Glen Fire Department, the Southern Tier Central Regional Planning and Development Board, Tanglewood Nature Center, the Chemung County SWCD and Schuyler County Cooperative Extension also helped make the program a success. The Conservation District's Elaine Dalrymple issued special thanks to McIntyre’s Bait and Tackle in Beaver Dams for the donation of worms for the fishing station and "to all the speakers who worked with the students." Top: Laine Sullivan of Tanglewood Nature Center holds a Great Horned Owl. She explained the unique behavior of owls to the students. WATKINS GLEN, April 26 -- The Schuyler County Soil and Water Conservation District (SWCD) held its annual Green Arbor Program distribution of bare root seedlings and transplants on Saturday, April 23 and over 130 residents purchased 11,500 trees and shrubs for conservation plantings this year. 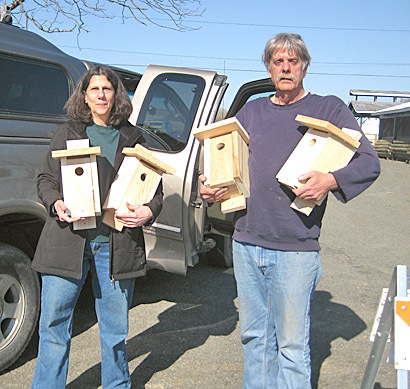 In addition, dozens of bluebird boxes made by the District were purchased. Trees are the unsung heroes of our environment, says the SWCD, noting in a press release that "they add value to property, conserve energy, lessen noise pollution, provide food for wildlife, stabilize top soil, with an added benefit of being a carbon sink. According to the U.S. Department of Agriculture, 'One acre of forest absorbs six tons of carbon dioxide and puts out four tons of oxygen while the net cooling effect of a young, healthy tree is equivalent to 10 room-size air conditioners operating 20 hours a day.'" The Green Arbor Program is set up to meet the needs of all county landowners, whether they have a small parcel or hundreds of acres. Species adapted to Schuyler County site conditions are selected to provide a variety of conservation uses. “We continue to offer this program for residents because of the enthusiasm of local folks for planting trees and shrubs; we love to see people of all ages working to protect our natural resources,” said Rebecca Collins, District Technician. Established in 1940, the Schuyler County Soil and Water District provides farmers, homeowners, organizations and municipalities with technical assistance to help conserve natural resources and be good stewards of the land. Services include conservation practices to protect water quality, erosion and sediment control, land drainage, assistance in obtaining state and federal permits, conservation education, map making and much more. WATKINS GLEN, April 6 -- The Schuyler County Soil and Water Conservation District (SWCD) wants to remind residents that the order deadline for the Spring Fish Stocking Program is approaching -- May 2. The six species of fish available to order in the spring are largemouth bass, channel catfish, fathead minnows, rainbow trout, hybrid bluegill and triploid grass carp. A minimum of 10 fish must be purchased except for the grass carp, which require a NYS permit before stocking is allowed. Also available for purchase are fish food, and materials to help clear ponds of algae such as beneficial bacteria, barley pellets and pond colorant. Fish will be delivered in boxes with oxygen-injected water, and buyers do not need to bring a container when picking up the fish. The delivery date and time for the spring program will be May 6 from 10:30 a.m. to 11:30 a.m. at the Lee Harlan Soil and Water Conservation Center at 2400 Meads Hill Road. For price information and order form visit the SWCD website at www.schuylerswcd.com; or call 535-0878. SCHUYLER COUNTY, March 11 -- As leaders in Geographic Information Systems (GIS) mapping, the Schuyler County Soil and Water Conservation District creates hundreds of maps for the public that include those for real estate professionals, for students, and for agricultural assessments, parcel boundaries, drainage plans and the like. A great deal of focus is on employing this state-of-the-art, GIS system to help municipalities use public funds efficiently, as they plan for upgrading and replacing infrastructure. This cutting-edge technology was first adopted by the Soil and Water Conservation District (SWCD) many years ago by former District Technician Lloyd Wetherbee. Lloyd was known throughout the State for his superior GIS knowledge and he willingly worked, for over a year, to pass this knowledge on to the current District Technician, Rebecca Collins. Rebecca has led efforts to utilize this technology to assist with the tracking, planning, and budgeting of municipal infrastructure. This mapping system is used daily to assist Schuyler municipalities, and residents, but also to aid in SWCD planning, permitting, and implementation. A very intensive project was recently undertaken by the District for the county and towns. It involved mapping the roads in each town, including the type of material from which they are made, and when maintenance work was last performed. Another big component of this project was to map the culvert pipes for each municipality. The culverts were not only mapped, but an Excel database was created that includes a multitude of information such as culvert type, size, length, condition, date installed, and even has a picture for reference. Rebecca utilized a backpack Global Positioning System (GPS) to physically map each culvert in the field, and 3,296 culverts were mapped in this arduous process. This database is updated annually with culvert replacements and upgrades. There was such a positive response from the various highway superintendents that the Schuyler Soil and Water Conservation District continued its efforts and mapped 4,000 signs along town and county roads. Again, this database tool allows the highway superintendents to more efficiently plan the use of their annual budgets. There are other uses for this technology that assist in planning, construction, and maintenance. SWCD has mapped the Hector Water District, the Village of Montour Falls water system, the Village of Odessa water system, and the Town of Reading Sewer District. All of this mapping and database work was done for no charge to the municipalities. Each year Schuyler Soil and Water tries to find more ways and more uses for GIS technology to save public money. SWCD utilized competitive grant funds to purchase the backpack GPS unit, a large scale printer called a plotter, and a commercial-sized laminator to protect the poster-sized maps created for residents and the municipalities. Having the ability to laminate maps is especially useful for highway departments and farms who often utilize them like a white board to track work to be performed at any given time. Afterwards, they can be simply erased and reused. 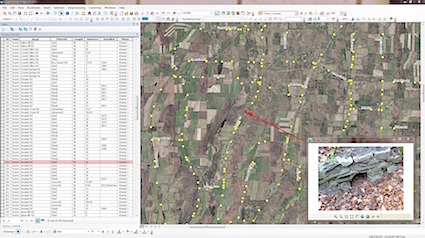 This GIS technology is available to all residents, and visits to the Soil and Water office, located at 2400 Meads Hill Road, Watkins Glen, NY are welcomed. 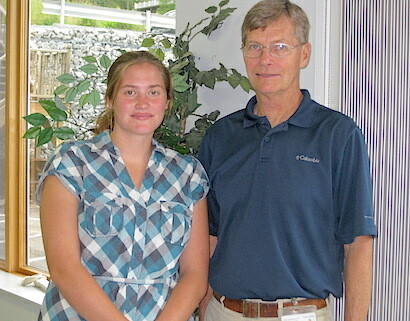 Top: GIS specialists Rebecca Collins, present Schuyler County SWCD Technician, and former SWCD Technician Lloyd Wetherbee. SCHUYLER COUNTY, Feb. 29 -- The Schuyler County Soil and Water Conservation District Tree and Shrub Seedling Sale order deadline is March 11. Call the District at 535-0878 or visit the website for the locations of order forms or for more information. 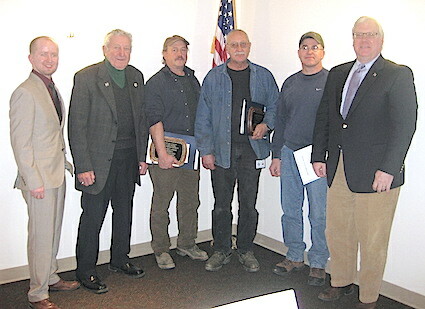 WATKINS GLEN, Feb. 8, 2016 -- The Schuyler County Soil and Water Conservation District (SWCD) held its annual luncheon at the media center at Watkins Glen International on February 5 and presented three Merit Awards and five Lifetime Service Awards. Merit Award recipients were Carl Scott, Central Garage Foreman; John Rekczis, County Highway Heavy Equipment Mechanic; and Mark Richer, District Technician, Chemung County Soil and Water Conservation District. Lifetime Service Award winners included the following retirees: Martin Roberts, Richard Richtmyer, Marvin Switzer, Ben Dickens, and James Curatolo. New York State Senator Tom O'Mara, also representing Assemblyman Phil Palmesano, presented joint proclamations to all awardees. Tom Hyland, Field Representative for Congressman Tom Reed, also presented the award winners with special certificates from the Congressman's office. A vast number and variety of conservation projects implemented in 2015 were showcased to the audience of over 100 attendees that included federal, state and local officials, municipal staff, and farmers. These projects exemplified the shared services efforts to ensure the most cost-effective means to install on-the-ground conservation. The presentation also highlighted the millions of dollars of competitive grant funding brought into the local community and the multiplier effect it has on the local economy. Highlights of this year's project implementation included: 38 stream and road stabilization projects; stabilizing over 18,000 feet of streams and road ditches and installing over 15,000 tons of rip rap; nine miles of road ditch and over 68 acres of critical area seeding was done with the Soil and Water's Hydro-seeder; and 14 large-scale farm projects were completed including several covered barnyards, manure storages, petroleum spill containment systems, milkhouse waste collection, winery pumice composting, rotational grazing and buffer installation, and well over 100 acres of no-till seedings. Four stormwater management projects were also completed installing the following: over 1,400 feet of grassed waterway, a large stormwater retention pond, along with a demonstration flexi-pave walkway. According to officials, every year the Soil and Water Conservation District focuses on implementation of conservation for the betterment of the community and its water quality and natural resources. This year was a particularly challenging year handling the normal workload of the Conservation District and then having the after-effects of a large flooding event everyone experienced. Top: Merit Award winners with local officials. From left: Tom Hyland, Field Representative for Congressman Tom Reed; Tony Specchio, SWCD Board Chairman; honorees John Rekczis, Carl Scott, Mark Richer; and State Senator Tom O'Mara. SCHUYLER COUNTY, Jan. 31 -- What follows are three workshops available in the coming weeks. Rare Fruit Workshops - Persimmons & Pawpaws - Held at 2 Locations! Wednesday March 30, 2016 from 10 a.m.-1:30 p.m. at Bath Civil Defense Building, 3 Pulteney Square East, Bath, NY OR from 6-9 p.m. March 30th at Vince’s Park, Intersection of Route 318 and 5/20, Seneca Falls, NY. Hobbyist, Homeowner, Commercial Grower Workshop. Interested in unusual fruits? Come learn all about growing pawpaws and persimmons! Topics include site selection, insects and disease management, pollination and sourcing plants. World renowned speaker and expert Jerry Lehman, will be sharing knowledge based on his 25 years’ experience. For more information contact: Roger Ort at 607-535-7161; or email rlo28@cornell.edu. Please visit http://cceschuyler.org/events for more information and to register for either workshop. SCHUYLER COUNTY, Jan. 12 -- Every year the Schuyler County Soil and Water Conservation District offers a Tree and Shrub Seedling Sale, also known as the Green Arbor Program, and 2016 will be the second year of the revived Fish Stocking Program. The Green Arbor Program allows landowners to purchase plants that not only encourage wildlife, prevent erosion, and protect water quality, but beautify property. The fish stocking program helps pond owners enhance species diversity. The Conservation District Green Arbor program offers a wide selection of evergreen trees, deciduous trees, shrubs, small fruits (including apple, cherry, pear, plum, and peach trees, blueberries, blackberries, and raspberries, strawberries and grapes), and groundcovers. The trees are bare root seedlings and transplants. Also offered are fertilizer tablets, rain barrels, bluebird houses, weed mats and tree tubes. The order deadline for trees and shrubs is March 11, 2016 and orders should be placed as early as possible to ensure availability. The six species of fish available to order in the spring are largemouth bass, channel catfish, fathead minnows, rainbow trout, hybrid bluegill and triploid grass carp. A minimum of 10 fish must be purchased except for the grass carp, and grass carp require a NYS permit before stocking is allowed. Also available for purchase are fish food, and materials to help clear ponds of algae such as beneficial bacteria, barley pellets and pond colorant. Three species of fish will be available in the fall stocking program -- yellow perch, black crappie and fathead minnows. Fish will be delivered in boxes with oxygen injected water, and buyers do not need to bring a container when picking up the fish. The deadline for the Spring Fish Stocking Program is May 2, 2016 and the Fall Stocking Program order deadline is October 3, 2016. Tree and fish order forms are available at various public places in the county or on line at www.schuylerswcd.com. This year’s plant and fish sales will give landowners an opportunity to conserve and enhance the natural resources of Schuyler County -- the mission of the Soil and Water District. Call the District at 535-0878 or visit the website for the locations of order forms or for more information. SCHUYLER COUNTY, Dec. 24 -- Governor Cuomo announced the release of program criteria for the $25 million Southern Tier Agricultural Industry Enhancement Program (STAIEP) on Monday, December 14. The eligibility requirements are now available online in the form of a fact sheet at www.schuylerswcd.com. The program will provide crucial funding for projects designed to help farms and agribusinesses expand and grow their operations, as well as increase environmental enhancements. Applications will be available beginning January 19, 2016 at your local Soil and Water Conservation District (SWCD). This innovative program will be utilized to enhance the economics of our local farming operations. The $25 million in funding has been split between the eligible 13 counties based on the number of estimated eligible farming operations. Schuyler County has been awarded $900,000 and Chemung County has been awarded $500,000. These funds will be utilized on projects that range between $20,000 and $100,000 in size. There is a minimum of a 10% cash match for projects that range between $20,000 thru $50,000. There is a minimum of a 25% cash match for projects that range between $50,001 and $100,000. The key is that the proposed projects will have a positive economic impact on the farming operation itself and implement an approved farm business or environmental plan. This allows for many potential eligible projects. Some ineligible projects include the purchase of equipment, land, or animals. There are several criteria that a farming operation has to meet in order to be eligible to apply for this source of funding. One of these criteria areas narrows the amount of eligible operations significantly to focus on those that earn their livelihood from their farming operation. This criteria states that for three out of the last five years the farming operation has to have received the Farmers’ Property School Tax Credit. This is explained in great detail in a fact sheet from the Farm Bureau on the Schuyler County Soil and Water Conservation District’s website www.schuylerswcd.com. There are many other criteria for eligibility, which are explained in great detail in the STAIEP fact sheet also found on the Schuyler County SWCD website. This initiative will be run through your Soil and Water Conservation Districts. All interested farming operations located in Chemung and Schuyler Counties are encouraged first to visit the Schuyler County SWCD website to see the qualifications for the program to determine if they feel their operation is eligible, and next to call Jerry Verrigni, District Manager of the Schuyler County SWCD, at (607) 229-9332. The Schuyler County SWCD works in partnership with the Chemung County SWCD on many of their agricultural projects. The Schuyler County SWCD is trying to make a concerted effort to visit and discuss this program directly with those thought-to-be-eligible farms and has done so with most of those potentially eligible in Schuyler County, and will try to complete most of those farms in Chemung County the week of the 21st of December. The following article was provided by the Schuyler County Soil and Water Conservation District. SCHUYLER COUNTY, Dec. 24 -- Reisinger’s Apple Country, owned and operated by Karen and Rick Reisinger, honored our local military veterans this past Veterans Day in a very unique and memorable way. Any military veteran was eligible to receive a free peck of apples of their choosing from Wednesday, November 11 through Sunday, November 15. Over 200 local Veterans participated and covered the full array of military branches. This special act of kindness acted as a gathering place for those veterans. Reisinger's kept a board with the names, dates of service, and branch of the military served of each veteran that participated. This allowed all of those veterans to re-connect with local veterans of our community. It also gave a place for those veterans to talk about their time of service, if they chose to. The Reisingers have been growing apples and other fruit crops for over 20 years at their u-pick business. They have been awarded for their environmental management work on multiple occasions through the Agricultural Environmental Management (AEM) program, run through the Schuyler County Soil and Water Conservation District. They are renowned throughout the region for their educational efforts for all interested in agriculture and fruit crops. Their generosity and sense of community has also been shown through their dedication to the Food Bank of the Southern Tier and its "Just Say Yes to Fruits and Vegetables" program that provides fresh food to those who often cannot afford it. It is these types of selfless efforts that make Schuyler County special. We all get caught up in our day-to-day, and the pace that our lives have become, but it is important to take time, as the Reisingers have, to appreciate those who have given the most to provide the freedoms we all enjoy each day. We all know many veterans. A simple letter, handshake, or thank you can mean a lot. WATKINS GLEN, Sept. 30 -- The Schuyler County Agriculture and Farmland Protection Board (AFPB) sponsored a tour of three Schuyler County farms on September 24 for elected officials and other community leaders. The purpose of the tour was to provide greater insights into the diversity and importance of the county’s largest industry: agriculture. Representatives from State Senator Tom O’Mara’s office and Congressman Tom Reed’s office attended, as did the Chairman of the County Legislature, Dennis Fagan; County Legislator Mike Lausell; County Administrator Tim O’Hearn; and the heads of the Chamber of Commerce, Rebekah LaMoreaux, and SCOPED, Judy Cherry, along with 15 other leaders. 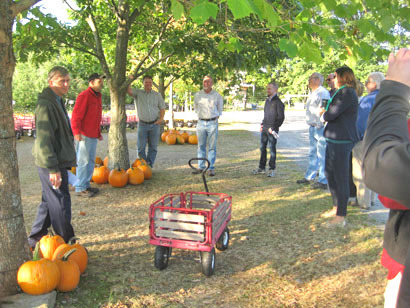 The three farms that were visited were Reisinger’s Apple Country in Dix, Westview Farm in Tyrone, and Shtayburne Creamery in Reading. All three farms have worked hard to develop their markets for high-quality apples and other fruit; grass-fed lamb and beef; and cheese and maple syrup, respectively. "The owners continue to look at new opportunities and all are involved in efforts to promote and increase the availability of fresh, healthy food to consumers," according to a press release from the tour. Angus Glen Farm in Dix, which raises grass-fed beef, hosted a lunch afterward that was sponsored by the Schuyler County Farm Bureau. The AFPB receives staff support from the County Planning Department and includes farmers and representatives from Cornell Cooperative Extension, the Soil and Water Conservation District, and Farm Bureau. The goals of the Board include: preserve a critical mass of both farmers and agribusinesses in the county; maintain farmland; help to diversify the agricultural economic base; increase public recognition of the value of agriculture and farmland, "and protect farmers from development and regulatory intrusions which threaten their ability to operate in a normal fashion as agricultural enterprises," said the press release. WATKINS GLEN, Aug 16, 2015 -- Small grains such as winter wheat, winter and spring barley, oats, rye, and triticale (a cross between wheat and rye) are grown in Schuyler County and throughout New York State. The fields can literally shine with the golden hues of the ripe grain at harvest time. Starting in mid-July and continuing through August, many farmers are on their combines with small-grain headers, and soon after, baling the wind-rowed straw. Both the grain and the straw have value. The straw from small grains makes excellent bedding for animals, and rye straw is especially sought-after by farmers raising horses, also known as equine farmers. These grains are also grown for forage for animals, which means they are chopped before reaching maturity or as a nurse crop for a new seeding of hay. Small grains are excellent in crop rotations as their roots help improve soil aggregation and the winter grains provide cover on fields during the winter and early spring seasons, reducing soil erosion. Small grains in a crop rotation also help disrupt harmful pest populations, including weeds, which can increase in a strictly corn/hay rotation. 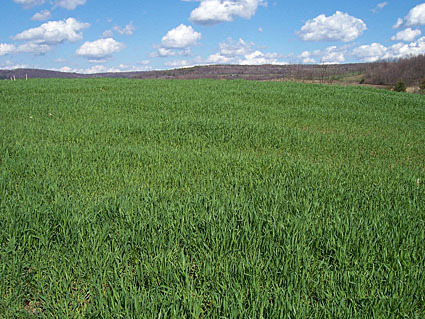 New York ranks 8th in the nation for oat acreage planted in 2014, according to the National Ag Statistics Service, while barley and wheat are lower in ranking. Small grains are an important crop, but they can be a challenge to grow in wetter climates, which can bring on leaf diseases and can delay planting of the spring grains. It takes a great deal of knowledge to grow them, and a sizeable investment in machinery. Seeing a beautiful field of small grains ready to harvest and the straw ready to bale, and knowing how much effort it takes to get to this point, makes one appreciate the scene even more. HECTOR, July 29, 2015 – Lakewood Vineyards, owned by the Stamp family, was honored for its commitment to environmental conservation at the annual Schuyler County Farm Bureau Picnic Tuesday by the Schuyler County Soil and Water Conservation District. The Conservation District presented the Stamps with an Agricultural Environmental Management (AEM) "Farmers Partnering to Protect Our Environment" roadside sign recognizing their conservation of natural resources and strong desire for environmental protection. The picnic, held at Hazlitt Winery in Hector, attracted 140 people, including town and county elected officials, State Senator Thomas O’Mara, and Alison Hunt, Deputy District Director for Congressman Tom Reed’s office. This is the seventh year of the AEM signage program in Schuyler County and the Stamp family is the 12th Schuyler farm family to receive the award. “AEM is a state program, and to receive a sign, a farm must have a high level of environmental stewardship and a solid commitment toward implementing practices to address the farm’s priority water quality concerns,” said Elaine Dalrymple, Conservation District Field Manager. Lakewood was one of the first farms in the county to participate in the AEM program. The Stamps have been farming in their present location for about 65 years, although their Schuyler ancestors and farming heritage go back many more generations. The fourth generation is now working on the farm, which is 220 total acres and 82 acres of grapes with at least 15 different varieties being grown. A winery was started 25 years ago and has expanded into one of the largest in the Finger Lakes. This farm has implemented many best-management practices (BMPs) to reduce nonpoint source pollution, including the use of row middle mulch and cover crops, diversion ditches and vegetated headlands to reduce erosion, an agrichemical mixing facility to prevent any potential pesticide spills from entering the environment, nutrient and integrated pest management including soil and petiole testing, pest scouting, and precise weather monitoring. The Stamps host many educational programs on their farm for both the farming and non-farming public, youth and adults. They are involved in numerous viticulture organizations that improve and promote the industry, including the Seneca Lake Wine Trail and the NY Wine and Grape Foundation. Eleven members from three generations of the family are actively involved with the farm. “We are very proud to be a family farm that grows and produces high quality grapes and wine, and know that to have our fifth generation in farming we need to protect our soil and water. The AEM program, in its many facets, has been very helpful to us in this endeavor,” said Chris Stamp, Lakewood owner. The Schuyler County Farm Bureau and the Schuyler County Agriculture and Farmland Protection Board are co-sponsors of the awards with the Conservation District. To learn more about the AEM program in Schuyler County, visit www.schuylerswcd.com or call the Schuyler County Soil and Water Conservation District at 535-0878. CAYUTA, June 16, 2015 -- Charlotte and Bob Collins have lived in Cayuta nearly their whole lives. Charlotte and Bob’s parents resided in Cayuta, but Charlotte moved away to Waverly for a short time when her father, who worked for the Lehigh Valley railroad, was transferred there. Bob and Charlotte were married in 1956 and lived on Varney Hill for a while, but because the school buses would not go up there back then, and their children were in early elementary school, they decided to move to their present location in the valley, on Conkrite Road. This is where Collins Sawmill is located. Bob has been sawing timber since he was a young man. He got interested in sawing by watching his father, Earl, who worked for Cotton-Hanlon for 30 years. Bob worked for Cotton-Hanlon for 25 years and was their head sawyer. He not only sawed local wood but wood that came from around the world, including mahogany -- very hard timber to saw. Bob left Cotton-Hanlon in 1974 and started his own sawmill, which has been in business ever since. Bob works with his nephew, Joe Eberhart, and they produce all sorts of wood products including molding, flooring and paneling, along with rough-sawed wood. They have a planer and they kiln dry wood. Joe does most of the sawing now, but Bob still helps in the mill every day. Charlotte keeps the books, with the assistance of their daughter, Debbie. Charlotte and Bob also have a son, Tim, and together there are six grandchildren, two step grandchildren and 11 great grandchildren. Bob served as the Cayuta Town Supervisor for 12 years, and was on the Cayuta Town Board for 20 years. He was also a County Legislator for two years. Charlotte has been on the Cayuta Town Election Board for 40 years. Bob was a very good friend of John Hall of Odessa, who passed away recently. He and John would travel all over the United States and Canada buying horses. Bob also traveled to find antique tractors, which he fixes up and shows at various fairs, and which he and his daughter drive in local parades. His favorite models are Fords. Bob has also raised beef cows and crops with his son and son-in-law. The Collins home has lovely floors made by Bob, and the location of their home and sawmill business is picturesque. Collins Sawmill remains an important Schuyler County family business and has succeeded through the honest, hard work of Bob and Charlotte, their children and now their nephew. It is a business, and a family, and a spirit that has helped make the county the thriving, unique place that it is. MONTOUR FALLS, June 6, 2015 -- About 160 sixth-grade students from the Bradford, Odessa Montour and Watkins Glen Central School Districts attended an outdoor education program, Conservation Field Day, on June 2 at the Millport Hunting and Fishing Club. The day-long program provided hands-on activities to stimulate youth to continue to explore and respect their natural surroundings and to show them that there are many professions that work in, and with, nature. Students learned about floodplains, tree identification, fire safety, birds of prey, and other wildlife, and learned how to fish, how maple sap is gathered and syrup produced, and the importance of modern wastewater treatment. The Field Day was organized by the Schuyler County Soil and Water Conservation District (SWCD) with assistance from the Millport Hunting and Fishing Club, the three school districts and their 6th grade teachers, the Schuyler County Water Quality Coordinating Committee and a number of local businesses and organizations. The SWCD extended special thanks to McIntyre’s Bait and Tackle in Beaver Dams for the donation of worms for the fishing station and to all the speakers who worked with the students. The Montour Falls Fire Department brought their pumper and fire truck to the club so all the students could use a fire hose. WATKINS GLEN, April 22 -- The Schuyler County Soil and Water Conservation District (SWCD) held its annual Green Arbor Program distribution of bare root seedlings and transplants on Saturday, April 18 and over 120 residents purchased 10,000 trees and shrubs for conservation plantings this year. In addition, rain barrels and dozens of bluebird boxes that were made by the District were purchased. The Green Arbor Program is set up to meet the needs of all county landowners, whether they have a small parcel or hundreds of acres. As always, species adapted to Schuyler County site conditions are selected to provide a variety of conservation uses. A fish stocking program is being offered this year, as well, and the deadline for ordering for the spring program is May 15. Visit the website for an order form or call the District at 535-0878 for more information. INTERLAKEN, April 10 -- Lively Run Dairy will celebrate the birth of their goat kids on May 9 and 10, Mother's Day weekend. Visitors are being invited to the farm to taste its delicious cheese and have a fun day with the goat kids. Lively Run is calling the even Just KIDding! According to a press release, "This is a fun and educational agritourism event for all ages. Activities will include: goat kid cuddling, bottle feeding, cheese tastings, goat milking demonstrations with our farmer, "Meet the Cheesemaker" tours, cheesecake (made from Lively Run cheese) and beverages, games for children, shopping for moms, and a raffle drawing every hour for a chance to win Lively Run cheese. (Proceeds will go to donating goats to families in need through Heifer International.)" Lively Run Dairy can be found on Facebook at FB/livelyrundairy, and on a website, www.livelyrun.com/events. When: Mother’s Day Weekend -­ Saturday, May 9 from 10 a.m. to 5 p.m., and Sunday, May 10 from 12 noon-4 p.m.
Activities: Goat Kid cuddling for everyone, bottle feeding, cheese tastings for $3, goat milking demonstration, Meet the Cheesemaker tours for $7, games for children, shopping for moms. Bottle feed a kid: 10 a.m., 1 p.m., 3 p.m..
"Meet the Cheesemaker" tours: 11 a.m., 2 p.m., 4 p.m. Bottle feed a kid: 12 noon, 2 p.m.
"Meet the Cheesemaker" tours: 1 p.m., 3 p.m.
Hand Milk a Goat: 1 p.m.
Why: This event is a great education family event because it gives people who are not normally exposed to farm life the opportunity to experience it first-hand. Experiencing farm life is important for people because they get an understanding of where their food comes from, and an appreciation for farm animals. Lively Run Goat Dairy is one of the longest operating commercial goat dairies in the country, beginning production in New York State in 1982 and pioneering goat cheese in the American marketplace. Their products contain no preservatives, no food colorings, no artificial additives of any kind, and use only vegetable rennet. 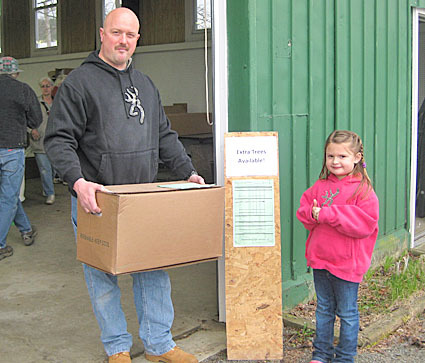 SCHUYLER COUNTY, March 19, 2015 -- The Schuyler County Soil and Water Conservation District (SWCD) will once again be working with USAg Recycling Inc. to offer local agricultural producers an environmentally “green,” convenient option for disposing of their empty agricultural plastic containers for the 2015 crop season. SWCD will have a collection in early spring and a second collection in late fall. Pre-registration is required, so if you wish to participate in the spring collection, call Schuyler SWCD at 535-0878. To help store containers until pick-up time, bags that hold fifty to sixty 2.5- gallon containers are available for free upon registration. ALBANY, March 19 -- Governor Andrew M. Cuomo has announced that 11 counties will be eligible under the proposed $30 million Southern Tier Agricultural Economic Development Initiative, first announced by the Governor last week. Eligible counties under this initiative will include Allegany, Broome, Cattaraugus, Chautauqua, Chemung, Chenango, Delaware, Schuyler, Steuben, Tompkins and Tioga. The program, included in the Executive Budget, will make available $30 million for projects that help farms and agribusinesses grow throughout the area, with additional funding to assist targeted agricultural economic development projects. "Agriculture remains one of top industries that drives New York’s economy and with this initiative, every farmer and vendor in the Southern Tier will have a chance to shape the future of their business," Governor Cuomo said. "I am proud of the incredible products grown and made in New York State, and urge lawmakers to join us in making this proposal a reality." Under the initiative, $25 million would help farmers increase agricultural production on farms and improve profitability, as well as support farmers in better managing environmental resources. Projects that are awarded state funding may receive up to $100,000, which will go toward funding up to 75 percent of an eligible project. Applicants are responsible for the other 25 percent, and all projects should be completed within one year of the contract. Those eligible to apply for this program would include: people, partnerships, associations, cooperatives, corporations, or LLCs that manage a “farm operation” as defined in section 301 of Agriculture and Markets. Costs could include construction, renovation, irrigation, drainage, environmental enhancements, fencing, trellis systems and greenhouses. Eligible applications for the environmental management aspect of this program will be required to have, within the past three years, participated in an agricultural environmental stewardship program, such as the NYS Agricultural Environmental Management Program and the USDA Natural Resources Conservation Service Conservation Program. A total of $5 million of this funding would be allocated for targeted agricultural economic development projects, such as farmers’ market expansions and forest productivity projects, as well as investments to spur agribusiness job creation in locations such as food processing plants in the Southern Tier. WATKINS GLEN AND HORSEHEADS, March 10, 2015 -- The Chemung and Schuyler County Soil and Water Conservation Districts (SWCD) and the agricultural community have lost two dear friends and conservationists -- dairy farmers Wilbur Vance of Beaver Dams and John Mann of Horseheads. Wilbur and John were highly-respected farmers who took especially good care of the land, using cropping practices such as strip cropping, cover crops, diversion ditches and crop rotation to prevent soil erosion. Leon Callahan, a neighbor, lifelong resident of Beaver Dams and fellow farmer, said that Wilbur “was always into doing something” and that one of his more recent passions was fixing up an older barn the Vances own near his property. “Wilbur was trying to get a foundation under the front," said Callahan. "He put in new wing walls and had replaced some of the roof. He always had on his bib overalls and pull-on boots and was such a hard worker,” Leon said. Wilbur’s curiosity in how nature works was contagious. His questions would stimulate many important discussions, and when he showed up at an agricultural or natural resources agency, you knew you would learn more from him than the other way around. His visits were usually not long but always memorable. He enjoyed reading and shared magazines and articles with friends he thought would be interested. He took very good care of his animals and loved tending calves and milking cows. John Mann also loved farming and was known for his ability to fix machinery; he was an excellent welder. Ross Lant, a nearby dairy farmer, was a very good friend of John’s, as was Ross’s dad, Fred. David Boor, a dairy farmer on Middle Road, also said that John was a really good neighbor. He recalled that in 1971, their family took a rare trip away from the farm to go to a Yankees game in New York City. Lightning struck their Harvestor silo and caught their barn on fire while they were all away. By the time they got home, John had already torn down the barn rafters and had about 50 neighbors helping to clean up the damage. The Chemung and Schuyler SWCD’s worked on many conservation projects with the Vance and Mann families, including nutrient management planning, manure storage to reduce winter spreading, silage leachate collection, cattle crossings, no-till planting and grazing management. Wilbur Vance and John Mann were farmers nearly their whole lives, farming on valley and hill land around Beaver Dams and Horseheads. 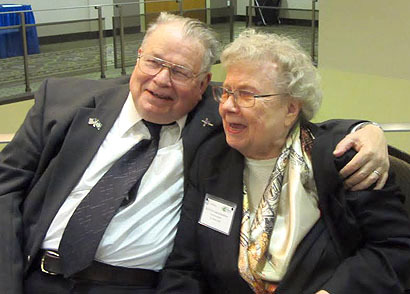 They passed away recently, but their accomplishments as leaders in the community, as friends, and in the use of farming practices that produce healthy food and protect the environment will inspire, always, the many people whose lives they touched. They were two of a kind. Top: Wilbur Vance with his granddaughter, Rachel, in their calf barn. WATKINS GLEN, Feb. 16, 2015 -- The Schuyler County Soil and Water Conservation District (SWCD) held an Annual Luncheon at the Watkins Glen Elks Lodge #1546 on Friday, Feb. 13, where accomplishments -- made possible with the help of many municipalities, the county, the Chemung County Soil and Water Conservation District, and other local agencies -- were reviewed for an audience of 80. --Two Merit Awards, to Art Austin of the County Highway Department and Daniel Thorpe of the Town of Hector Highway Department. Don Castellucci, field representative for Congressman Tom Reed, and Sperry Navone, chief of staff for Assemblyman Phil Palmesano and also representing State Senator Tom O’Mara, presented the award winners with special certificates from their offices. Karen and Rick Reisinger were honored for their skills in raising high-quality, horticultural crops with the conservation of natural resources as an important goal. They have been growing apples and other fruit for over 20 years in Schuyler County, and their u-pick farm attracts thousands of customers every year because they have created a family-friendly atmosphere that makes picking fruit fun while providing an education on how our fruit is grown. Besides apples, they raise red raspberries, peaches, plums, blueberries, strawberries, pears, nursery stock, and pumpkins, and they make maple syrup. They were one of the first farms recognized in the state Agricultural Environmental Management (AEM) program for their conservation farming practices, which include use of a sophisticated weather station and spray equipment to reduce the use of pesticides; pest scouting; and nutrient management practices to enhance soil quality and reduce the use of fertilizers and prevent soil erosion. The Reisingers work with the Food Bank of the Southern Tier and its "Just Say Yes to Fruits and Vegetables" program that provides fresh food to those who often cannot afford it. Their daughters Lisa Brower, Tammy Daniels and Amy Wysocki help on the farm, as do many of their grandchildren and their son-in-law, Ward Brower. “We enjoy providing fresh, healthy food to families in a way that helps maintain a rural quality of life and rural landscape, supports our local economy and safeguards our natural resources. We feel it is important for people to understand how food is grown, and we love that our family is involved with our business,” said Karen Reisinger. 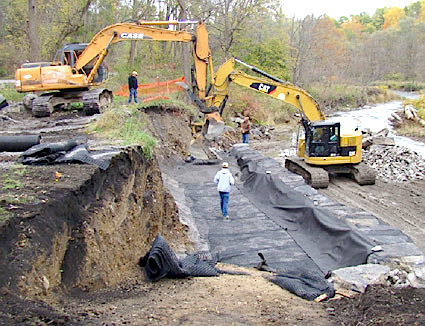 Art Austin has helped the District on many projects over the years, but was especially recognized for his work this past summer when Schuyler County SWCD was asked to assist Yates County with stream restoration after the devastating storm that hit that county. Austin is an equipment operator for the county and worked with Jim Barrett of the SWCD staff to reconnect streams to their floodplains, putting in long hours to implement an emergency stream intervention approach. “His diligence helped make an almost impossible situation work out with amazing efficiency,” said Jerry Verrigni, District Manager. Daniel Thorpe is also an equipment operator, but with the Town of Hector, and he too has assisted the District on numerous conservation projects over the years. His wealth of experience and can-do attitude helped the District complete six significant stream stabilization projects in 2014 alone. Some of the soil and water improvement projects implemented in 2014 and highlighted during the meeting include: nine stream stabilization projects; waterway construction, shoreline protection, hard road ditch stabilization; 18 miles of seeded road ditches and 77 acres of other critical area seeding; planning and implementation of agricultural environmental management on 100 area farms including a winery pumice composting facility, 13 acres of riparian buffers, and 179 acres of cover crops and mulching; mapping of culverts and signs for the county and local municipalities and educational events, many done in cooperation with Farm Bureau and Cornell Cooperative Extension. “We truly could not do all the work we do without the help of our municipal highway departments and neighboring Soil and Water Conservation Districts, and want to acknowledge the importance of shared services to achieve natural resource protection,” said Verrigni..
SCHUYLER COUNTY, Jan. 13 -- The Schuyler County Soil and Water Conservation District has begun its annual Tree and Shrub Seedling Sale, also known as the Green Arbor Program, designed for landowners to purchase plants that not only encourage wildlife, prevent erosion, and protect water quality, but beautify property. The order deadline is March 10, 2015 and orders should be placed as early as possible to ensure availability. Tree order forms are available at 26 public places in the county or online at www.schuylerswcd.com. The Conservation District offers a wide selection of evergreen trees, deciduous trees and shrubs (including apple and peach trees, blueberries, blackberries, and raspberries, and a pond habitat pac), groundcovers, grasses, and ferns. The trees are bare-root seedlings and transplants. The evergreen seedlings are sold in bundles of 25 trees while the evergreen transplants and the deciduous trees and shrubs are sold in bundles of 10 (except apple and peach trees, which are sold individually, and small fruit species in bundles of 3). Also offered are fertilizer tablets, rain barrels, bluebird houses, weed mats and tree tubes. This year’s plant sale will give landowners an opportunity to conserve and enhance the natural resources of Schuyler County -- the mission of the Soil and Water District. Call the District at 535-0878 or visit the website for the locations of order forms or for more information. READING, NY, Dec. 30 2014 -- The Stamp family and their farm, Lakewood Vineyards -- located just east of Reading Center -- are known to most Schuyler County residents. And Bev Stamp, the wife of the late Lamont (Monty) Stamp, exemplifies the vibrancy of this family, as its senior member. She continues to work alongside her children, their spouses and grandchildren, and her generosity and positive outlook make everyone who meets her feel warm inside. Bev was born and grew up in Olean, NY, in Cattaraugus County. She loved to play basketball at the YMCA in the local church league and she learned to sew by just watching her mother, an excellent seamstress. She doesn’t remember ever getting formal lessons, but it didn’t take her long to relearn the skill when her daughter, Teresa, was of 4-H age. Bev took over a club that was well known for its fun sewing activities. Teresa is a very accomplished seamstress as well and went to National 4-H competitions several times in the "Make it Yourself with Wool" contest. But how did Bev get from Olean to Schuyler County? Bev attended Morrisville State College, where she met Monty. According to Bev, he was her first and last blind date. Monty’s parents were from Reading Center; his mother’s maiden name was Lucy Hillerman. Monty’s father, Frank Stamp, grew up on a dairy farm just south of Reading Center that also had a few grapevines. Frank moved to Maryland, where he practiced dentistry for a number of years and where Monty was born. When his back could no longer take the strain of bending over patients (before the advent of modern, adjustable dentist chairs), Frank moved back to Schuyler County in 1951 and bought the Lakewood farm. The following year he started planting grapes, cherries, and strawberries and tending the apple trees that already grew on the farm. During their college years, Monty brought Bev to Lakewood and taught her how to drive a tractor. Bev remembers him telling her that he would not propose until she had mastered the skill. She did. In 1957 Monty permanently returned to the farm and began planting more and more grapes. He won the National Plowing Competition in 1958 on an International Harvester, specializing in contour plowing. Furrows from the moldboard plows were judged based on their lack of overlap, and row ends needed to be exactly even. Monty and Bev were married in 1958. 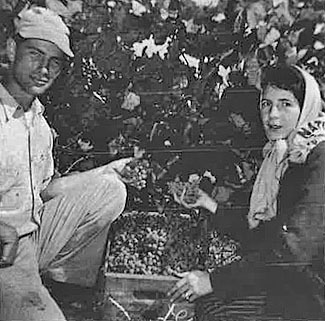 In the early years, Bev helped with many farm tasks, including trimming, pruning, and suckering the grapes. She and Monty raised four children -- Chris, Mike, Dave and Teresa -- while Bev remained active in the business. Other agricultural activities with which Bev was involved included Women for New York State Wine, the Grape Country Cooperative that produced "VineFresh," a pink grape juice, and marketing "Finger Lakes Finest," a frozen concentrate made from local grapes and produced by Seneca Foods. In 2013, she was honored as one of New York State's "Women of Distinction," with state officials noting her long role as an ambassador for the wine and grape industry and her active role over the years in the Seneca Lake Wine Trail. She has also served on various viticulture conference committees. Bev has nine grandchildren, and several are interested in pursuing viticulture or are already working in the wine business. The winery is owned and operated by the Stamp family. Chris is the winemaker and worked for the Ohio Research and Development Center (ORADC) with Ohio wineries. His wife, Liz, who works full time at the winery, also worked with ORADC (with poultry) before they came back to the farm. Dave has always been the vineyard manager, and his new wife, Erin, a Chicago native, helps in the winery. Teresa Knapp, Bev’s daughter, is a manager at the New York Wine and Grape Foundation and works at Lakewood two or three days a week. Mike is a local insurance agent whose wife, Kaye, also assists at the winery. When asked what Bev enjoys most about their family operation, she said that she loves the beauty of the Finger Lakes region, its quiet moments and being a part of the land. She loves seeing her family make something from the soil and feels that farming instills a certain kind of imagination. She is concerned that with youth spending hours on computers versus being outside, this creative trait may be forgotten. Bev continues to use her imagination inspiring family, friends and visitors. She is a very special part of the beauty of Schuyler County. 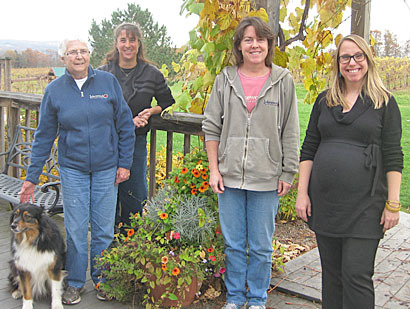 Top: From left: Bev with her dog Presh; Teresa Knapp, Bev’s daughter; Liz Stamp, daughter-in-law and wife of Chris; and Erin Stamp, daughter-in-law and wife of Dave, on the porch at Lakewood in November. Erin and Dave now have a new baby. 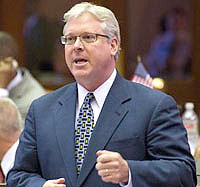 ALBANY, Dec. 22 -- Legislation sponsored by State Senator Tom O’Mara (R,I,C-Big Flats) and Assemblywoman Donna Lupardo (D-Endwell) to make New York the 16th state in the nation to establish a framework for growing industrial hemp as a way to diversify and strengthen the state’s leading agricultural industry has been signed into law by Governor Andrew Cuomo. The legislation (S.7047/A.8297, Chapter 524 of the Laws of 2014) was approved by the Legislature in June. It authorizes a pilot program to allow hemp production for research to begin immediately by the state Department of Agriculture and Markets, and state colleges and universities. Cornell University’s College of Agriculture and Life Sciences has already expressed interest in participating in the pilot program. York seize this new agricultural market." A provision in the federal Farm Bill enacted earlier this year legalized the growth of hemp for research by state departments of agriculture or institutions of higher education in states where it has been approved by law. Fifteen states already have laws in place that allow them to begin producing hemp. The O’Mara-Lupardo measure will establish procedures for New York to begin taking advantage of this research and economic opportunity. Hemp is used around the world to produce fabric, rope, paper, oil, soap, lotion and even food. It also is rich in Omega 3 and Omega 6 fatty acids, which gives it numerous health benefits to both humans and animals. Its value as a rotation crop and biofuel has also been recognized. Both the stalk and seed from hemp can be used in the production of a variety of goods including textiles, building materials, paper, food, body products and environmental products such as biofuels. In 2012, retail sales from imported hemp products were estimated at $500 million. The New York Farm Bureau also supports the new law, which it says would position the state as a leader in hemp production. boost the state’s rural economy,” said Dean Norton, President of New York Farm Bureau. ELMIRA, Oct. 14 -- Two key provisions of a comprehensive “Young Farmers NY” program unveiled earlier this year, enacted as part of the 2014-15 state budget, are now in effect, says State Senator Tom O’Mara, a member of the Senate Agriculture Committee. The “Young Farmers NY” strategy, which O’Mara co-sponsored, combined financial and educational initiatives and incentives aimed at keeping New York State’s leading industry competitive for the next generation. Applications are now being accepted for two of the enacted programs: the New York State New Farmers Grant Fund, and the Young Farmers Loan Forgiveness Incentive Program. 1.) the New York State New Farmers Grant Fund, which offers grants of up to $50,000 for eligible beginning farmers participating in the production of an agricultural product at commercial farm operations statewide. Eligible project costs include leasing or purchasing farm machinery and equipment; constructing or expanding farm buildings or systems; and purchasing supplies such as root stock, seed or fertilizer. The new grant fund is being administered by Empire State Development (ESD). 2.) the “Young Farmers Loan Forgiveness Incentive Program” to provide loan forgiveness awards for students who earn an agricultural degree from a State University of New York (SUNY) college or university, including the College of Agriculture and Life Sciences at Cornell University, and work in New York State agriculture for at least five years after graduation. The deadline for submission is December 15, 2014. New York’s 36,000 farm families help make New York’s $5.2 billion agricultural industry a national leader. O’Mara said that the state’s aging farmer population poses one of the most serious threats to the future of New York’s family farms. The average age of farmers in both the United States and New York is approximately 57 years old. A growing percentage of all farmers are aged 65 and above. 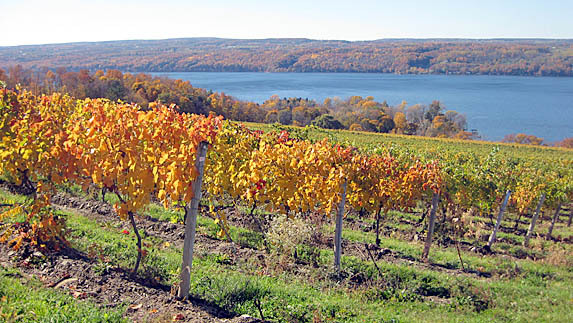 Vineyards benefit from the climate created on the hills along the Finger Lakes. Row middles are kept vegetated to reduce erosion. The following article was prepared by the Schuyler County Soil and Water Conservation District. WATKINS GLEN, Oct. 1, 2014 -- With apple and grape harvest in full swing in September and October, we are reminded how fortunate we are to be living in a region with a climate moderated by deep lakes. The cool breezes that flow across the water help prevent early blooming in the spring and early frosts in the fall. Schuyler County has a rich, long history of fruit growing, including tree fruit such as apples, peaches, pears, cherries and apricots, and small fruits such as grapes, raspberries, blueberries and strawberries. All of these fruits require a great deal of knowledge to grow on a commercial scale, skills often handed down through family generations. These skills include the implementation of conservation practices to prevent erosion and protect water quality. There are many practices being used by fruit growers such as diversion ditches, and grassed waterways that carry water slowly across the landscape; cover crops, row middle management, mulching, and headland protection to prevent erosion; nutrient management planning to refine fertilizer use; and agrichemical handling facilities, computerized weather stations, sophisticated, reduced-volume sprayers, and integrated pest management to prevent spills and reduce pesticide use. The Schuyler County Soil and Water Conservation District (SWCD) is working diligently, says its officials, to help not only Schuyler County fruit growers, but also growers throughout the region in cooperation with other Finger Lakes Conservation Districts. The Districts coordinate the voluntary Agricultural Environmental Management (AEM) program on a local basis, the purpose being protection of our natural resources. Schuyler SWCD has obtained cost share funding for agricultural best management practices totaling over $14,238,969, and $3,183,490 for fruit growers alone. 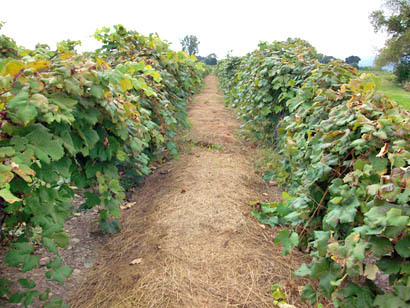 Top: Mulch used in vineyard row middles reduces erosion and improves soil health. HECTOR, July 25, 2014 -- Carole and Mark Harth, owners of Bear Farm on Satterly Hill Road, were presented with an Agricultural Environmental Management (AEM) "Farmers Partnering to Protect Our Environment" roadside sign Thursday recognizing their conservation of natural resources and strong desire for environmental protection. The Schuyler County Soil and Water Conservation District presented the sign award during the Schuyler County Farm Bureau summer picnic held at Logan Ridge in Hector. More than 160 people were in attendance, including town, county and state elected officials and a representative from Congressman Tom Reed’s office. 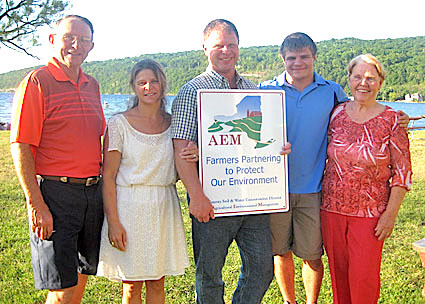 This is the sixth year of the AEM signage program in Schuyler County, and the Harths are the 11th Schuyler farm to receive the award. “To receive a sign, a farm family must have a high level of environmental stewardship and a solid commitment toward implementing practices to address the farm’s priority water quality concerns,” said Elaine Dalrymple, Conservation District Field Manager. Bear Farm has been operated by the Harths for 30 years. They own and rent 90 acres and raise 150 ewes and about 175 lambs along with bees for honey production, and chickens for eggs and meat. They use rotational grazing for their animals to reduce erosion and for high quality feed. They have installed miles of perimeter and internal fence and protect their riparian areas. A heavy use area near their barn has been improved, reducing sediment runoff. "The AEM program helped us install many of the best management practices that we use, and we will strive to continue to improve our farm to protect the water quality of the Seneca Lake watershed,” said Carole Harth. “We are located in the headwaters area of a pristine tributary to the lake and we want to continue farming in a way that helps keep the stream in that condition,” added Mark. The Harths are instrumental in the success of the Finger Lakes Sheep Producer Co-op, which coordinates the selling of local wool through its wool pool. They also sell wool yarn, mittens, socks and hats at their farm. The Schuyler County Farm Bureau and the Schuyler County Agriculture and Farmland Protection Board are co-sponsors of the awards with the Conservation District. AEM is a statewide program with over 10,000 farms voluntarily participating. In 2013, more than 1,300 agriculture best management practices were implemented on farms across the state through the program. To learn more about the AEM program in Schuyler County, visit www.schuylerswcd.com or call the Schuyler County Soil and Water Conservation District at 535-0878. 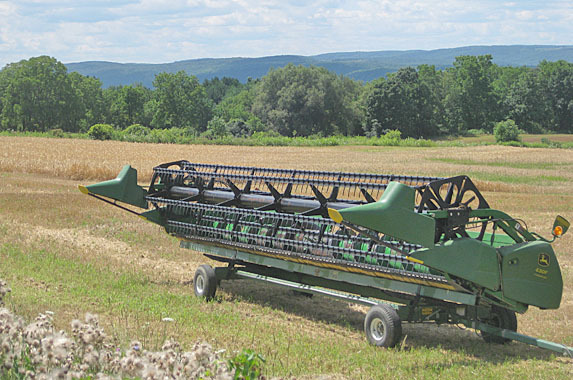 WATKINS GLEN, June 25 -- Schuyler County has received the highest statewide funding level under the latest round of state grants to help New York State farmers implement enhanced soil and water conservation practices, State Senator Tom O'Mara announced Wednesday. The Schuyler County Soil and Water Conservation District (SWCD), which applied for and will administer the grant, will receive $1,683,820 to assist projects at 20 farms over a five-county area. According to district officials, specific projects will focus on protecting multiple drinking water sources including Seneca Lake, Cayuta Creek, the Chemung and Susquehanna rivers and, ultimately, the Great Lakes and Chesapeake Bay. “These grants directly benefit the farms in our communities, but they are even more far-reaching to protect valuable natural resources for all of the residents that live in these communities,” said Schuyler County Soil and Water District Manager Jerry Verrigni. “They help to enhance these natural resources and make farms more sustainable, which aids our open space, rural character and tourism-driven economy. The latest round of competitive state grants, totaling $13.8 million to help more than 200 farms statewide, were awarded to 32 soil and water conservation districts. The funding is aimed at addressing water quality challenges facing farms in priority watersheds throughout New York State by supporting the New York State Agricultural Environmental Management (AEM) framework. The projects are designed to further the implementation of agricultural water quality best management practices to protect natural resources and, at the same time, maintain the economic viability of New York State agriculture. Local conservation districts, including Schuyler, work to implement plans in line with the goals of local farms and the needs of local watersheds. Schuyler County Soil and Water will partner with area farmers to implement conservation best management practices including but not limited to waste management systems, soil conservation systems, composting facilities, silage leachate controls, stream corridor management, and erosion control practices. Sixth graders practice extinguishing a fire with the Valois-Logan-Hector fire department. 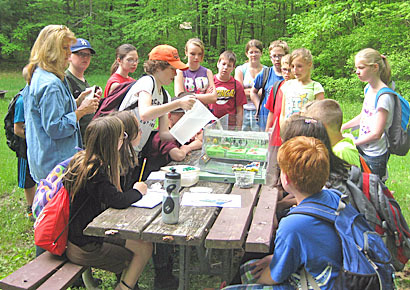 HECTOR, June 8 -- A total of 175 sixth-grade students from the Bradford, Odessa Montour and Watkins Glen Central School Districts attended an outdoor education program, Conservation Field Day, on June 3 at the Finger Lakes National Forest. The day-long program, cut a little short by rain this year, provided hands-on activities to stimulate youth to continue to explore and respect their natural surroundings and to show them that there are many professions that work in and with nature. Students learned about the importance of floodplains, forests, fire safety, the water cycle, and wildlife and learned how to fish, how maple sap is gathered and syrup produced, and how dairy animals are fed. The Field Day was organized by the Schuyler County Soil and Water Conservation District (SWCD) with important assistance from the Finger Lakes National Forest, the three school districts and their 6th grade teachers, the Schuyler County Water Quality Coordinating Committee and a number of local businesses and organizations. 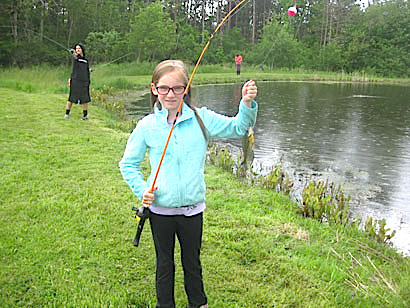 "Special thanks are extended to McIntyre’s Bait and Tackle in Beaver Dams for the donation of worms for the fishing station and to all the speakers who worked with the students," said SWCD spokesperson Elaine Dalrymple. The proposed new loan fund, which was given the Senate’s approval Tuesday, would be administered by the New York State Energy and Research Development Authority (NYSERDA) and provide state grants and low-interest loans to help dairy farmers undertake energy efficiency projects and purchase cutting-edge energy technologies. Earlier this year, according to the U.S. Department of Agriculture, New York reclaimed its place as the nation’s third-largest milk-producing state. struggled with low milk prices, an outdated federal price control system and the escalating costs associated with running family farms. Energy costs are particularly burdensome. Utilities have a harder time servicing farms because of their remote locations at the end of the electric grid infrastructure. According to O’Mara, the proposed new Dairy Farm Improved Energy Efficiency Loan Fund would provide state assistance to help more dairy farmers utilize high-efficiency lighting, pumping and cooling equipment, and other energy management systems, and could result in significant energy savings and increased milk yields. It would also, he added, help accelerate the development of New York's energy services industry, providing new and expanded job opportunities. Supporters of the proposed fund, including O’Mara, believe strengthening the energy systems of individual farms and developing micro-grids in remote areas will enhance the overall reliability of the electric system. The legislation (S.1081/A.4021) must be approved by the Assembly and signed by Governor Andrew Cuomo before becoming law. It’s currently in the Assembly Economic Development Committee and is sponsored by Assemblyman Bill Magee (D-Nelson), who chairs the Assembly Agriculture Committee. WATKINS GLEN, May 14 -- The Schuyler County Soil and Water Conservation District (SWCD) held its annual Green Arbor Program distribution of bare root seedlings and transplants on Saturday, May 3 and over 140 residents purchased 15,000 trees and shrubs for conservation plantings this year. In addition, 18 rain barrels and dozens of bluebird boxes that were made by the District were purchased. The Green Arbor Program is set up to meet the needs of all county landowners, whether they have a small lot or hundreds of acres. As always, species adapted to Schuyler County site conditions were selected to provide a variety of conservation uses. Established in 1940, the county Soil and Water Conservation District provides farmers, homeowners, organizations and municipalities with technical assistance to help them manage natural resources and be good stewards of the land. Services include conservation practices to protect water quality, erosion and sediment control, land drainage, assistance in obtaining state and federal permits, conservation education, and more. SCHUYLER COUNTY, May 14 -- A new collaboration between the Seneca Lake Pure Waters Association (SLPWA) and the Community Science Institute (CSI) to monitor streams flowing into Seneca Lake has kicked off with volunteer training workshops, which are now completed. Monitoring will begin in late May. The goal of the pilot Stream Analysis Project is to monitor three streams that flow into Seneca Lake in order to begin to characterize water quality and identify major sources of nutrient and chemical pollution that enters Seneca Lake. The Seneca Lake Pure Waters Association, whose mission is to enhance and preserve the quality of Seneca Lake, is concerned about the future water quality of Seneca Lake and its tributary streams. Recent studies by the Finger Lakes Institute indicate that phosphate and nitrogen levels are increasing in the lake. Although several scientific research studies have been done on the water quality of the lake itself, little data exists for many of Seneca Lake's tributary streams, which affect the water quality of Seneca Lake as a whole. The Community Science Institute, whose mission is to empower citizens to monitor and protect water quality, has been monitoring Cayuga Lake tributary streams with volunteer groups since 2002 and now has over 100 monitoring locations in the Cayuga Lake watershed. Volunteers collect water samples from fixed locations and the CSI certified water testing lab performs tests to characterize the water quality, publishing results in their free online database at www.communityscience.org/database. SLPWA approached CSI in 2013 to develop a pilot program for the Seneca Lake watershed, similar to CSI's Cayuga Lake volunteer program. In subsequent months, SLPWA recruited more than 40 of its members to volunteer to monitor three tributary streams as part of the pilot program: Catharine Creek in the south, Big Stream in the west, and Reeder Creek in the east. Volunteers were trained during two recent workshops where they learned about how to select monitoring locations, collect representative water samples from a stream, and complete chain-of-custody forms for tracking samples. Each of the selected streams are home to sources of pollution entering the lake. The pilot program will document the extent of these as the streams move throughout the watershed and eventually empty into Seneca Lake. The long-term plan is to expand the number of monitoring locations on tributaries in the Seneca Lake watershed. Volunteers were planning their first monitoring event on May 19th. Results will be published in CSI's online database once certified analysis has been completed. For more information, visit www.communityscience.org or www.senecalake.org. OWEGO, April 26 -- Bradford Central School was the Schuyler County winner of the Regional Envirothon held at the Tioga County Sportsmen’s Center on Thursday, April 24, defeating Odessa-Montour after O-M had held the honor for several years. The "Weeping Angels" (Bradford's Luke Campbell, Amanda Machuga, Nisa Stopka, Valerie Ball and Austin Sorber) not only came in first out of eight teams from Schuyler County, but were fourth overall out of the 34 teams competing from five counties: Schuyler, Chemung, Broome, Tioga and Tompkins. Two Odessa-Montour students, Zach Peoples and Dan Rounds, were on the winning team for Chemung County, "The Hardwoods" of GST (Greater Southern Tier) BOCES. The "Weeping Angels" will represent Schuyler County at the New York State Envirothon at Morrisville State College on May 21 and 22, while "The Hardwoods" will represent Chemung County. The Bradford "Ranger Rick and Pals" (Montana Towner, Mike Wood, Alex Wood, Liz McIlwain and Olivia Spangenberg) were this year’s Schuyler County second-place team, and the Bradford "Bush Bandits" (Katara Buckley, Dustin Rogers, Jacob Campbell, Austin Sanford and Rachael Bonning) came in third. Two other Schuyler County students, Colton Arcangeli of Watkins Glen and Brian McLean of O-M, were on the 2nd and 3rd place teams for (GST) BOCES. This outdoor education event is organized by the Soil and Water Conservation Districts, which saw 44 Schuyler students participating this year. Battling for the chance to represent their county at the statewide event, the students’ knowledge was put to the test as the teams completed tough exams in Aquatics, Soils, Forestry, Wildlife, and this year’s Current Issue, "Sustainable Local Agriculture/Locally Grown." Essential support for the Envirothon is provided by the school science teachers, the school districts, and also local businesses that donate funds for financial support. This year’s Schuyler County Envirothon sponsors, to date, are: Cotton-Hanlon Inc., Watkins Glen Elks Lodge #1546, Sawmill Creek Vineyards, Reisinger’s Apple Country, Lakewood Vineyards, Montour Falls Moose Lodge #426, David L. Sidle Insurance Agency and the Watkins Glen Fire Company. The Bradford teams are coached by high school science teacher Rebecca Schrader; the Odessa-Montour teams by science teacher Doug Chapman; and the BOCES teams by Don MacNaughton and Fred Kelly. The Schuyler County Soil and Water Conservation District provides programs and services to help residents and communities manage and protect the natural resources of Schuyler County. HECTOR, April 17 -- Officials from the Finger Lakes National Forest have teamed up with the National Wild Turkey Federation and Cornell Cooperative Extension Service in an effort to observe and celebrate Arbor Day. The coalition of partners will meet up with a local 4-H group and RSVP volunteers at the Hector Grazing Association Headquarters (5046 Searsburg Road) at 9 a.m. Saturday, April 26. Once gathered, the group will get a brief Arbor Day presentation before walking to the nearby Ballard Pasture Riparian Area, where several tree plantings will be conducted. The Forest Service says that the effort is not only geared toward promoting riparian restoration on the Finger Lakes National Forest, but also toward promoting Elm restoration and research. Scheduled to be planted are 20 Dutch Elm Resistant American Elms which have been provided by the Northern Research Station. The Elm trees will be planted on a research grid with specific spacing and fencing so that they are protected from deer browsing and cattle. 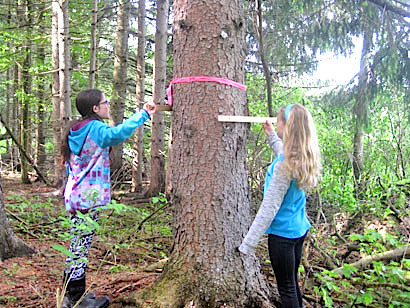 “This is one of many ways that the Finger Lakes National Forest is working to connect our youth with nature. We are always looking for opportunities to engage and educate those who appreciate open spaces and conservation,” said Tim Noon, Natural Resource Specialist for the Finger Lakes National Forest. Officials said the event would not be possible without support from key partners including Kevin Yoder from the National Wild Turkey Federation, Erin Nyquist from the Cornell Cooperative Extension Service, 4-H and RSVP volunteers, as well as Seneca Meadows landfill. Jeff’s Onsite Services has also stepped up and will be contributing the use of a portable toilet at the planting site for the day. The mission of the U.S. Forest Service is to sustain the health, diversity and productivity of the nation’s forests and grasslands to meet the needs of present and future generations. The agency manages 193 million acres of public land, provides assistance to state and private landowners, and maintains the largest forestry research organization in the world. Public lands the Forest Service manages contribute more than $13 billion to the economy each year through visitor spending alone. Those same lands provide 20 percent of the nation’s clean water supply, a value estimated at $7.2 billion per year. The agency has either a direct or indirect role in stewardship of about 80 percent of the 850 million forested acres within the U.S.
A recent survey by the Centers for Disease Control and Prevention revealed that Lyme’s Disease is about 10 times more prevalent than previously believed. An estimated 300,000 people are diagnosed with the disease each year, mostly in the Northeast. The disease is named after Lyme, Connecticut, where it was first identified in 1975. Lyme’s is caused by a bacterial spirochete that can be transmitted to people, dogs and some other animals when bit by an infected tick. Recent surveys of adult ticks in Schuyler County revealed that nearly half were carriers of Lyme’s. This is bad news considering that tick populations are also on the rise due in large part to milder winters and strong deer populations. But regardless of the causes, the new reality is that both ticks and tick-borne illnesses are here to stay. To date, there are five known tick-associated diseases in New York. Lyme’s is by-far the most prevalent disease, with 78 confirmed cases reported in Tompkins County alone last year. The symptoms of Lyme’s include fever, headache, fatigue, malaise and body aches. A pronounced, round-shaped rash centered on the tick bite may also appear, but is an unreliable indicator of being bitten by infected ticks. The good news is that these tick-borne illnesses can be readily treated with antibiotics. The bad news is that tests for these diseases are unreliable in the early stages of infection, and each disease requires a specific test. If left untreated, Lyme’s can cause arthritis and more severe problems. Symptoms and complications vary between the tick-borne illnesses, but all are serious and require immediate medical attention. Despite the increasing risks of ticks and their diseases, no one should be afraid of stepping off the back porch to enjoy their properties and the outdoors. The first step to preventing tick illnesses is awareness. Suspect that ticks could be present anywhere, anytime (even in the winter) and take appropriate measures such as protective clothing, appropriate use of repellents (which should not be considered guaranteed protection from tick bites! ), and diligent inspection during and after a trip to tick country. In the 1990s I worked several years as a consulting forester in southern New England, our home just five miles from Lyme. Contact with ticks was a daily part of life, but so was checking for them throughout the work day and upon returning home. Field clothing was left outside our house on the mud porch, not in the bedroom! The frequency and intensity of inspections increased during the cooler months of spring and fall. The second step to protecting yourself is to suspect Lyme’s disease sooner rather than later if suffering from unusual symptoms. Awareness and knowledge of tick-borne illnesses is on the rise in the medical community, but your doctor may need encouragement to test for tick diseases – especially when bite marks or rashes are not observed. Negative test results should be suspect, and retesting for both Lyme’s and other tick diseases is warranted if symptoms persist. And finally, take a pro-active vs. reactive approach to managing for ticks around your home and property. Studies done in Connecticut indicate that removing invasive shrubs along walking trails and the extended backyard significantly reduced tick habitat and thus contact with ticks. Another approach is to treat household pets with topical flea and tick products to reduce the chances that they are bringing unwanted hitchhikers home. As spring approaches, thoughts of field work and equipment fill the minds of local farmers. Just in time, the New York Farm Bureau District 4 Young Farmers are coming together to hold their 3rd Annual Equipment Consignment Auction at 10 a.m. Saturday, April 5 at the Chemung County Fairgrounds. The consignment auction provides local residents the opportunity to clean out barns, garages and homes to sell their equipment while supporting the New York Farm Bureau District 4 Young Farmers. The group works with Howard Visscher of Visscher Auction and Realty, Nichols, NY (607-699-7250 or http://www.visscherauction.com/) to put on the consignment auction. A portion of all equipment sold on Saturday, April 5 will go directly to the New York Farm Bureau District 4 Young Famers. The funds are then used to promote New York Farm Bureau and agriculture to the next generation of agriculturists. In addition to running the auction, this small group will also run the food tent the day of the auction, providing a hot lunch for attendees. The New York Farm Bureau District 4 Young Farmers are 18-35 year olds involved with agriculture from Chemung, Schuyler, Steuben, Tioga and Tompkins counties. Concentration on developing leadership skills, influencing agriculture policy, and promoting agriculture awareness are the main focuses for the group. Holding events like the consignment auction helps draw attention, new members, and build funds for other social and agriculture educational events. Last summer the group was able to hold an afternoon event at Tioga Downs, touring and learning about the race track and horses. In addition to building important leadership skills, the state young farmer program offers competitive events and scholarships for high school students. For more information see http://www.nyfb.org/. And look for the NYFB District 4 Young Farmers on Facebook. If you have any questions about the auction, contact Alan Hughson (607-857-4930) or Nicole Rawleigh (607-664-7245). MONTOUR FALLS, April 1 -- A presentation will be held by the Hunting Lease Network from 7-8:30 p.m. April 7 at the Schuyler County Human Services Complex, Room 120. The Hunting Lease Network (HLN) is an internet based service for landowners, hunters, and anglers. Its unique system is used to arrive at fair hunting or fishing lease agreements. Now found in 22 States, HLN offers benefits to landowners of additional income, craft leases unique to each property, aid in reducing crop damage, knowing who is on your property, and requiring liability coverage of each hunter or fisherman. More information can be found at www.NationalHunting Leases.com. This presentation is brought to you by Cornell Cooperative Extension of Schuyler County and the Schuyler County Farm Bureau, with support from the other four county Farm Bureaus in District 4 -- Tompkins, Tioga, Steuben, and Chemung. Light refreshments will be provided. RSVPs can be made to lwickham@nyfb.org or by calling 607-535-3072. BINGHAMTON, March 20 -- Glenn Larison of Odessa was honored at the annual Water Quality Symposium sponsored by the New York State Conservation District Employees’ Association recently in Binghamton. Larison was presented with the prestigious New York State Director Award for his many contributions over 16 years as a Board member for the Schuyler County Soil and Water Conservation District but also for his active participation on the New York State Association of Conservation Districts Board and for his numerous other community efforts. As a county legislator, Larison represented Schuyler County on the Inter-County Association of Western New York that includes county leaders from 19 counties, and was its Vice President for many years, making sure that issues important to Schuyler County were brought up and presented to State and Federal officials. He regularly went to Albany and to elected officials’ local offices to lobby for his constituents’ concerns. --"Go placidly amid the noise and the haste, and remember what peace there may be in silence." --"Speak your truth quietly and clearly; and listen to others, even to the dull and the ignorant. They too have their story." The following was provided by Elaine Dalrymple of the Soil and Water Conservation District. WATKINS GLEN, March 6, 2014 - After an arduous winter, the arrival of spring is especially anticipated this year. One of the more vivid signs of this solstice will be the bright green from the early growth of winter grains such as wheat and barley and from fields planted with cover crops. Cover crops are crops grown solely to provide soil cover and for improving soil health. They are also called green manures. Farmers try to plant cover crops in the fall on as many fields as possible. 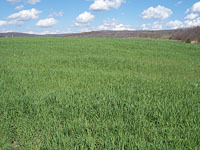 Winter rye (also called cereal rye) is often used and is plowed down before it gets too tall in the spring, but many other crops can also be used, including clover and special types of radishes. They build and maintain active and stable organic matter for the soil, improving soil tilth -- the physical condition of the soil. And they alleviate soil compaction. Cover crops reduce erosion because the soil can absorb more water and the plants absorb the impact of rain. The growing plants recycle nutrients such as nitrogen; the roots take them from the soil in the fall and they are resupplied for the next crop when the cover crop is plowed down in the spring. Cover crops can also help with weed suppression and break the cycle of problematic insects and diseases. They supply food and habitat for wildlife and beneficial insects. Cover crops are just one of many Agricultural Environmental Management (AEM) practices being used by all types of farmers, including dairy and other livestock, field crops, vegetable, grape and other fruit growers. “Farmers know that in order for their businesses to remain strong, they need to be vigilant about protecting the environment," said Jerry Verrigni, District Manager of the Schuyler County Soil and Water Conservation District. 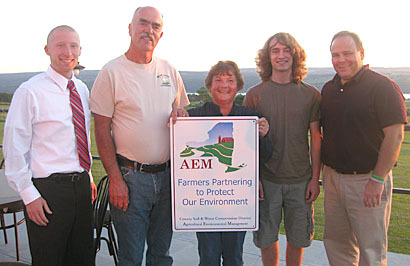 "There are over 200 farmers that participate in the AEM program in Schuyler County. It is a voluntary program that assists farmers in their environmental stewardship efforts, and the District has helped many farms with cost-share assistance for cover crops and many other practices. O’Mara, who also serves as one of 10 members on the Legislature’s joint, bipartisan Commission on Rural Resources, was also joined at a news conference to promote the plan by statewide farming advocates, including New York Farm Bureau President Dean Norton. New York’s 36,000 farm families help make New York’s $5.2 billion agricultural industry a national leader. O’Mara said that the state’s aging farmer population poses one of the most serious threats to the future of New York’s family farms. The average age of farmers in both the United States and New York is approximately 57 years old. A growing percentage of all farmers are aged 65 and above. stay on the land and encourage more young people to consider careers in agriculture. They said that their plan includes new ideas as well as programs that have worked in other states, and acknowledges the nation’s goal of attracting 100,000 new farmers over the next five years. -- increased state support for the highly successful Future Farmers of America (FFA) in-school program to encourage high school students in rural communities to learn about farming and explore career opportunities.